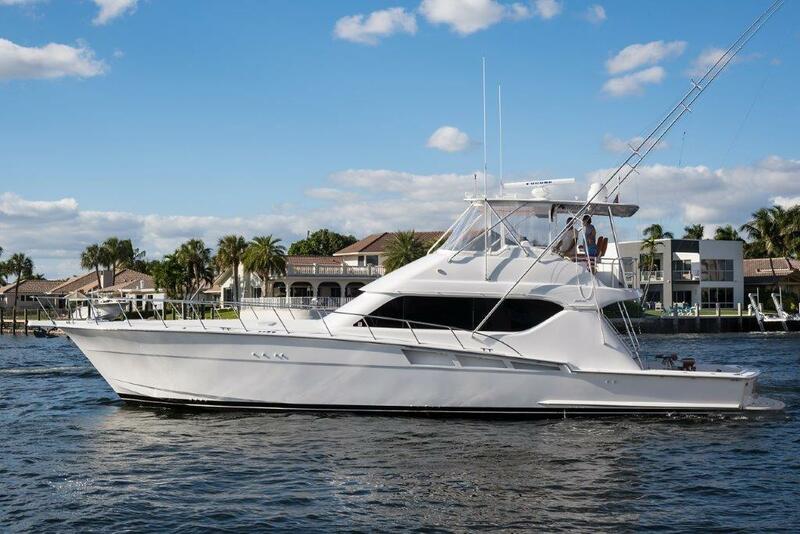 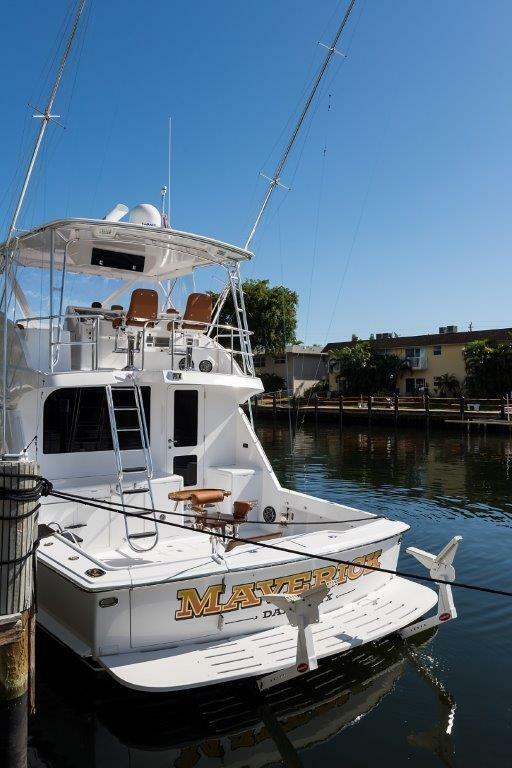 2000 Hatteras 60 Convertible "Maverick"
You will not find a nicer 60' HATTERAS on the market, MAVERICK will not disappoint anyone. 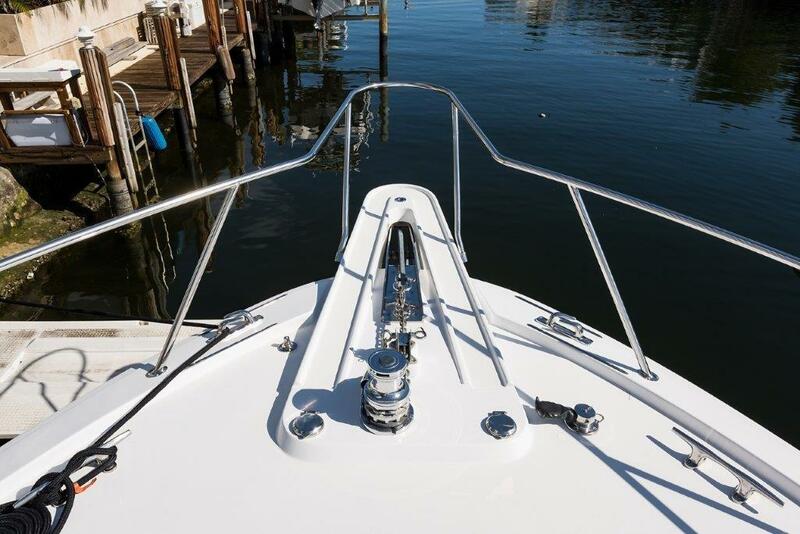 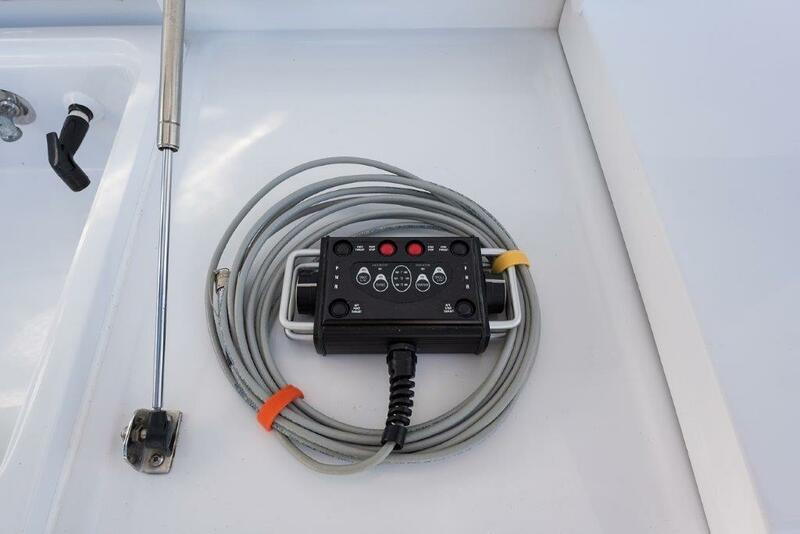 This is not a normal 2000 60’ HATTERAS CONVERTIBLE and it shows throughout the boat from stem to stern. 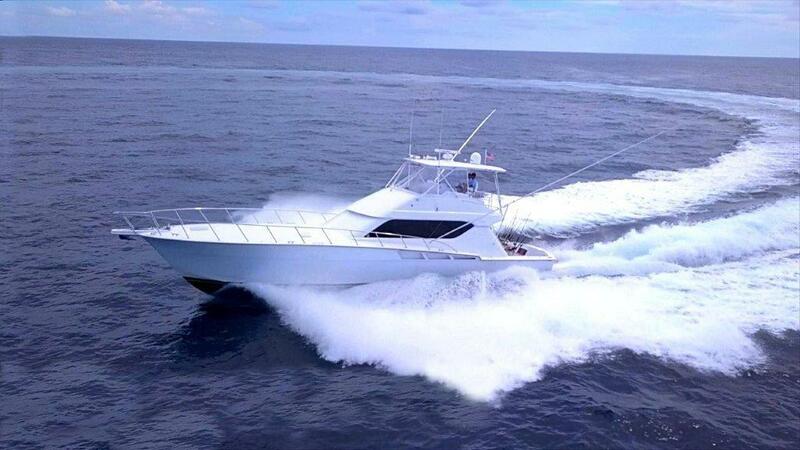 From 2000 until 2011 MAVERICK was cruised in the Great Lakes for 5 months out of the year and stayed in a covered and heated shed the rest of the year. 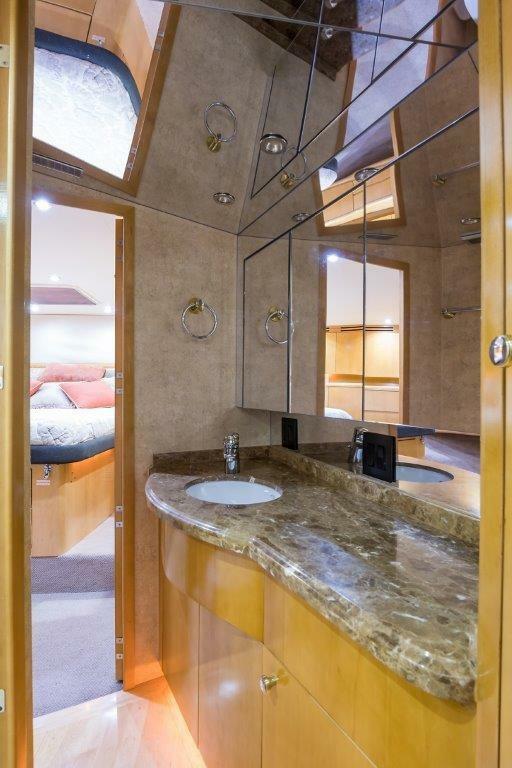 She has been babied and meticulously maintained everywhere you look. 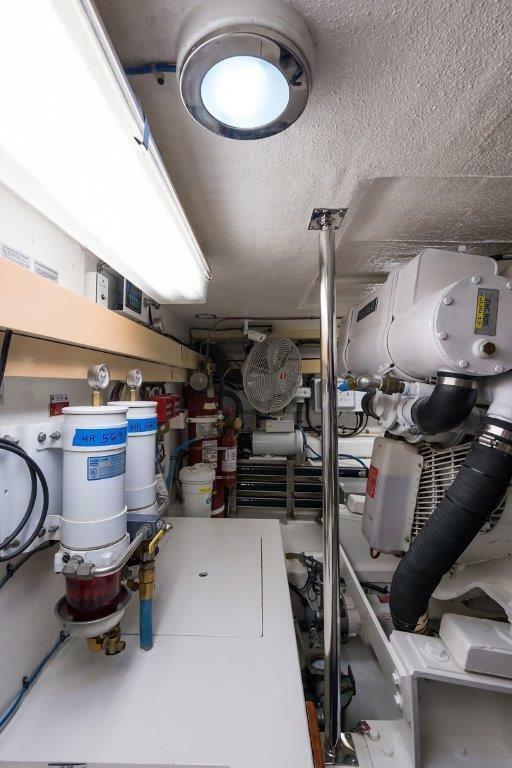 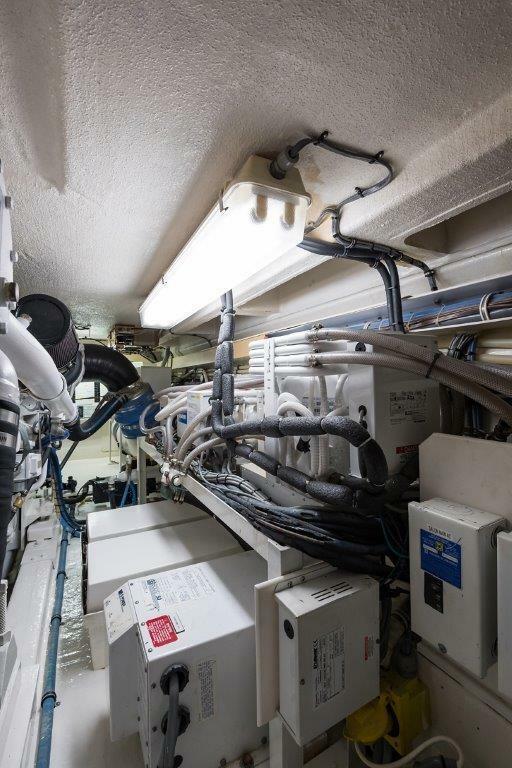 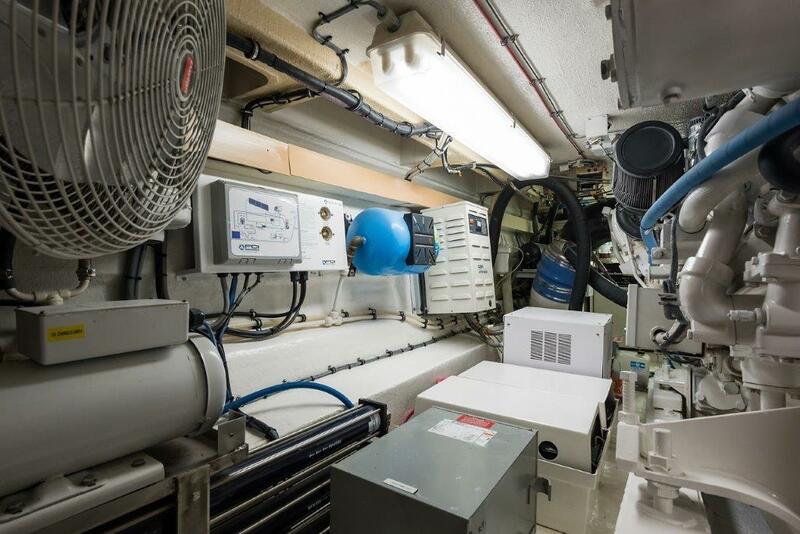 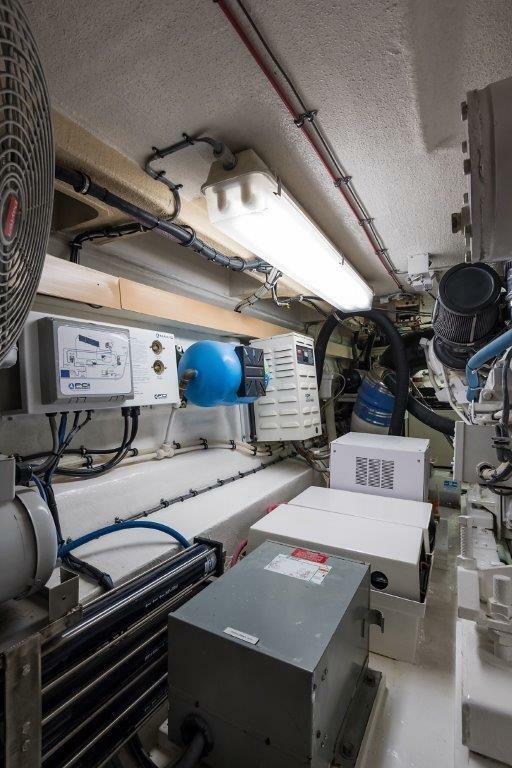 The engine room is spotless like the rest of the boat and will set the stage for the rest of the boat. 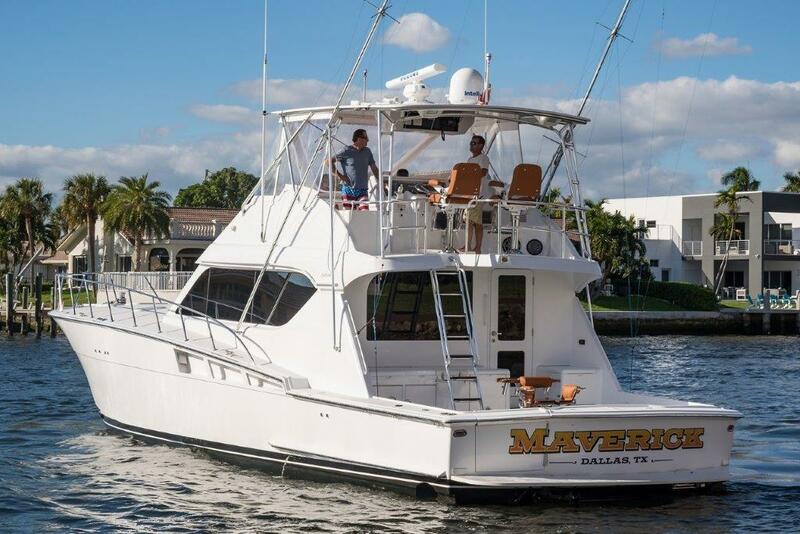 If you are looking for a meticulously maintained sportfish that was a freshwater cruised boat until 2011 with low hours on preferable CAT power and just about every conceivable option on the boat you could want, come and look at MAVERICK. 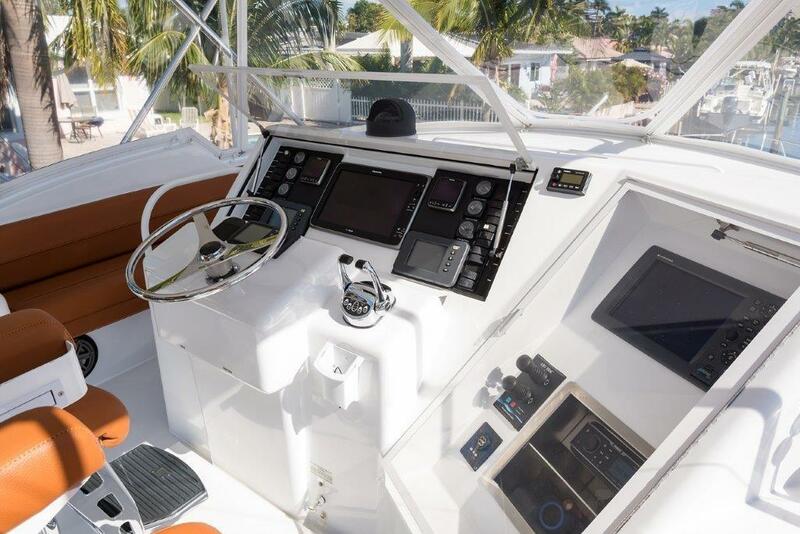 Trades considered Open/Express boats and center consoles. 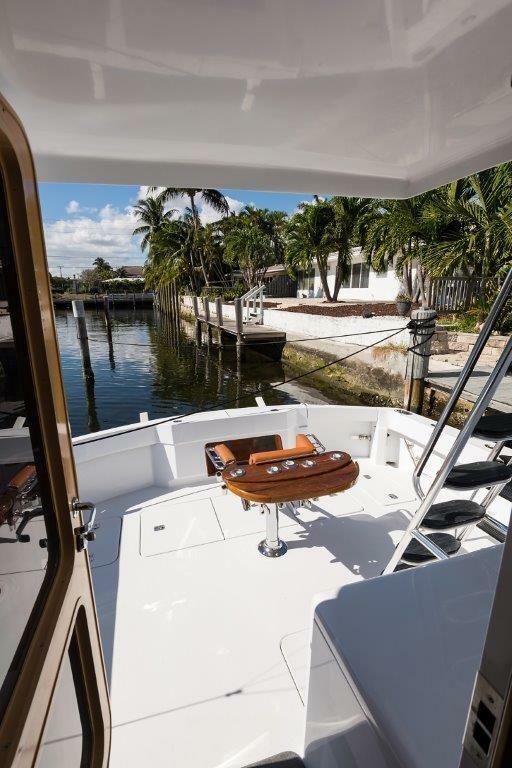 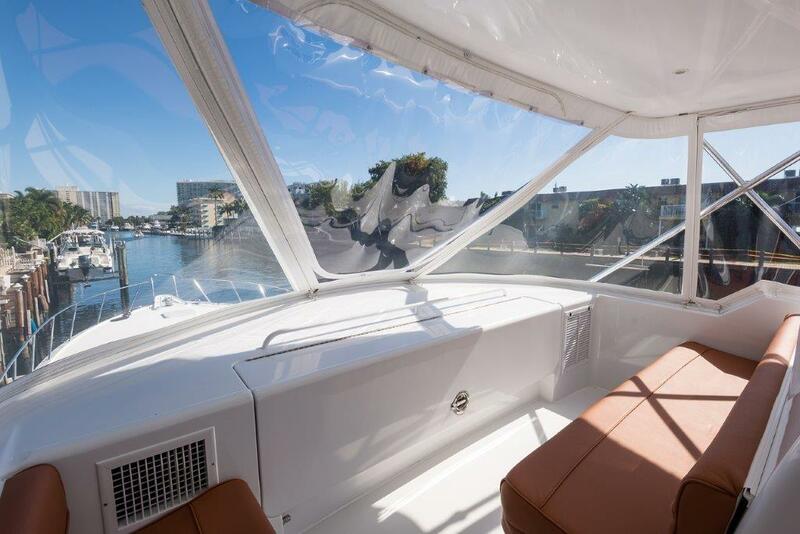 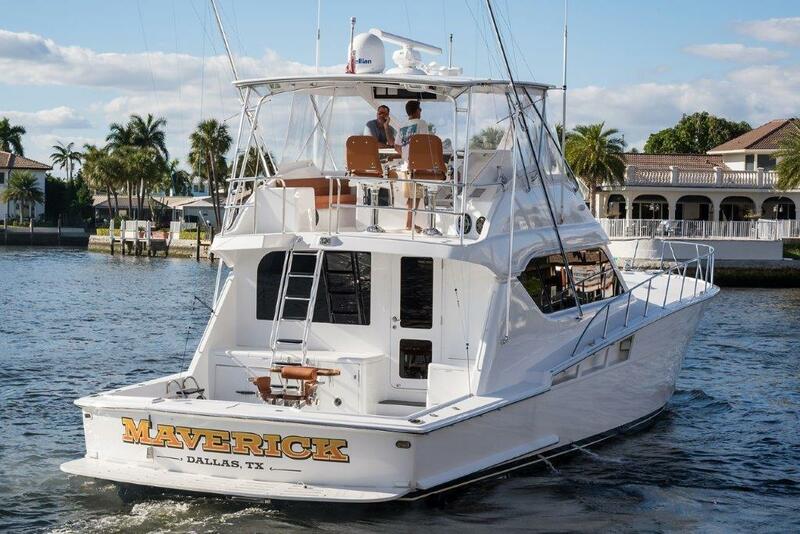 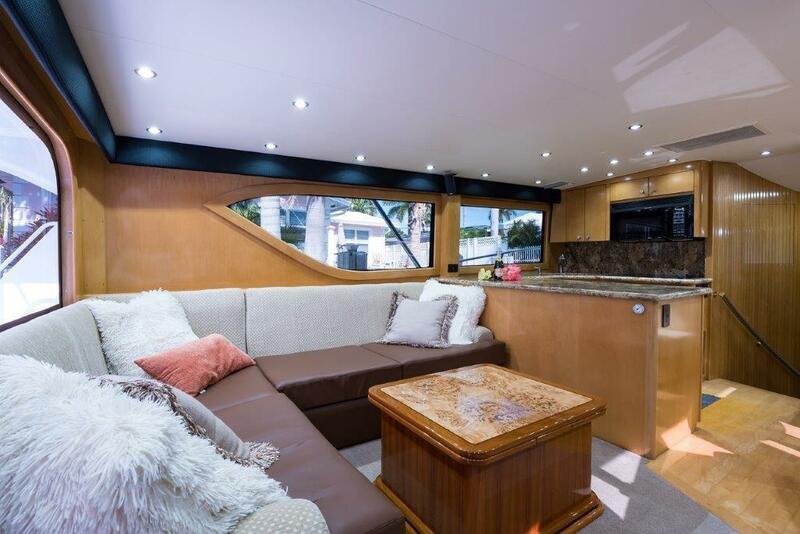 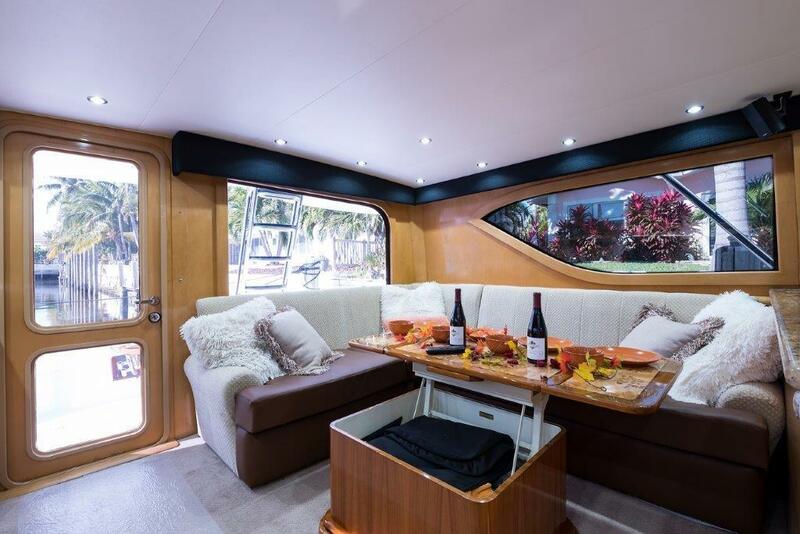 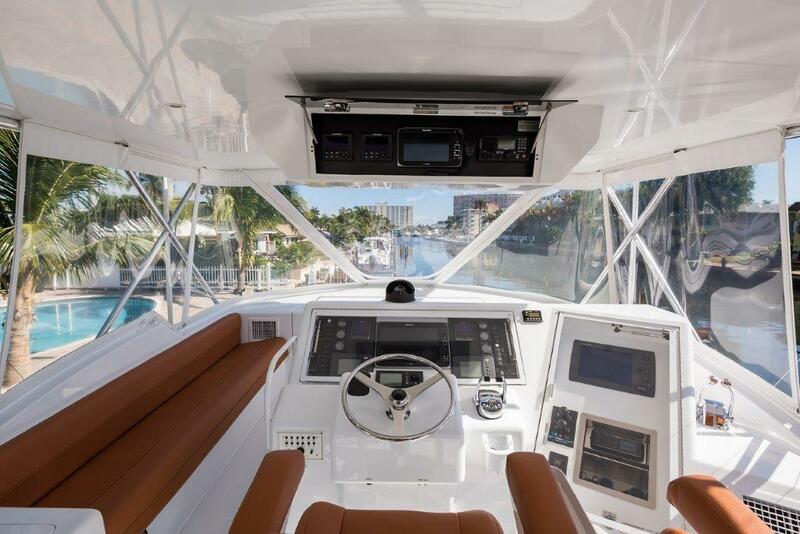 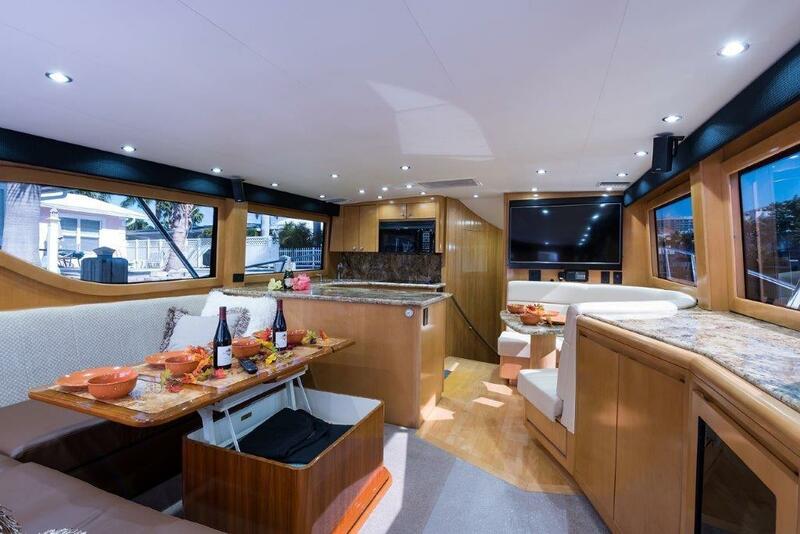 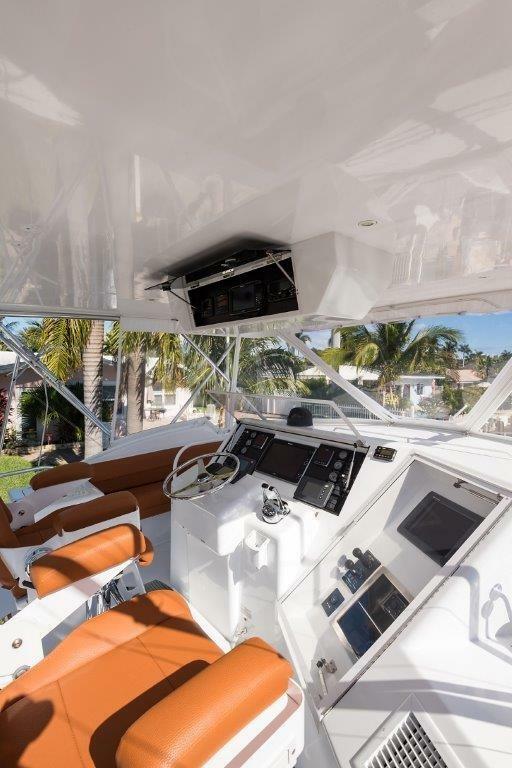 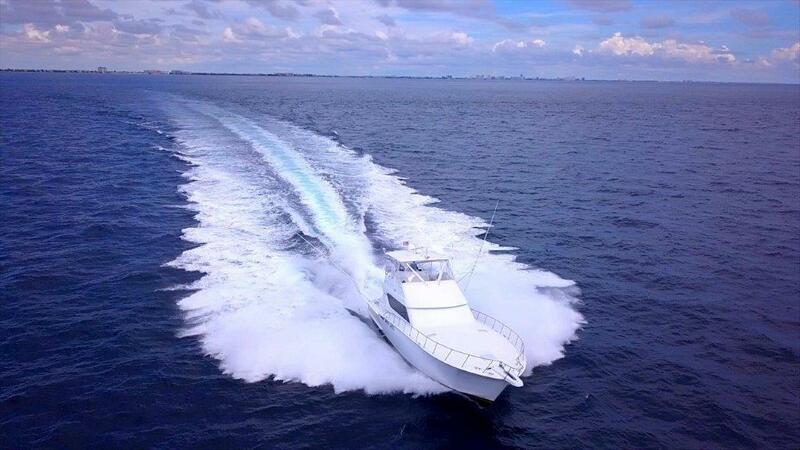 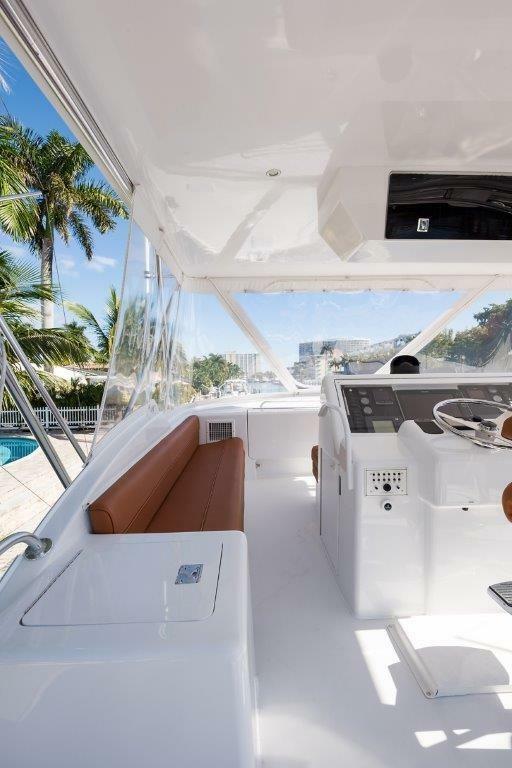 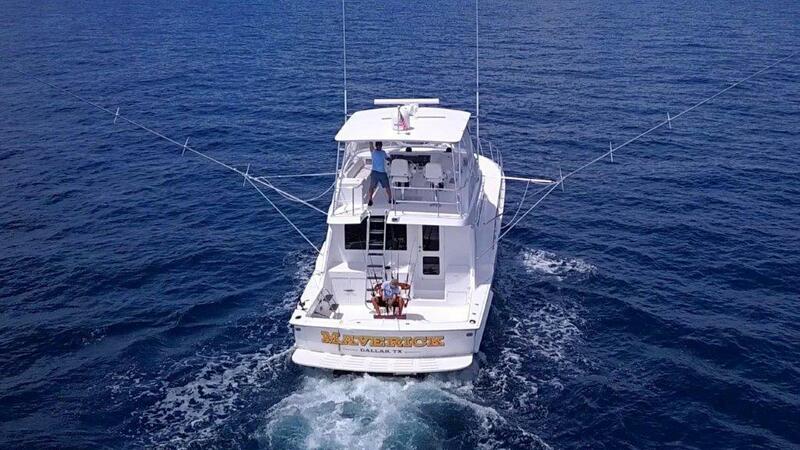 Overview Maverick is an extraordinary example of a 60 Hatteras Convertible that truly defies her age. 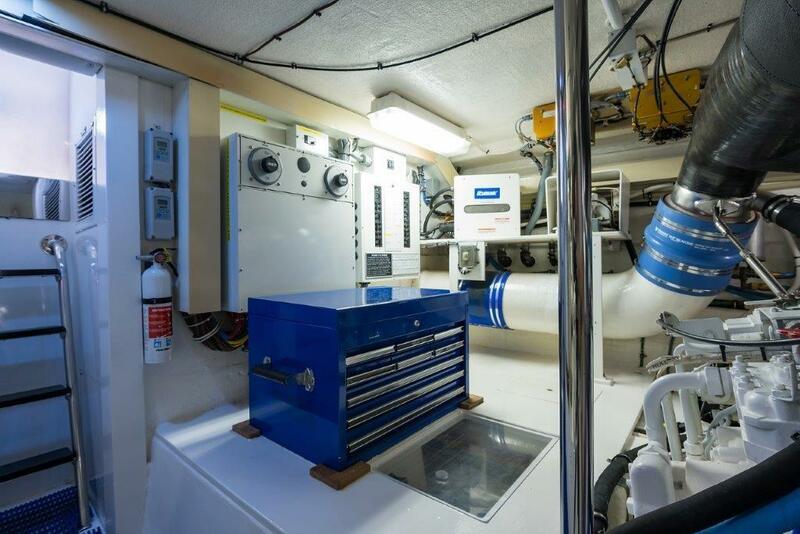 She spent the first eleven years of her life in fresh water on the Great Lakes, used only in the summer months and stored inside in a heated facility during the colder months. 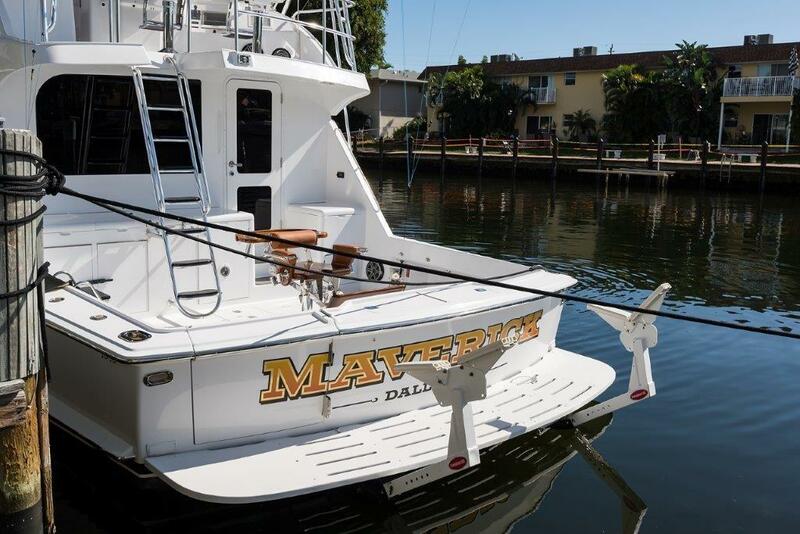 Maverick has enjoyed a meticulous maintenance program and constant updates since new. 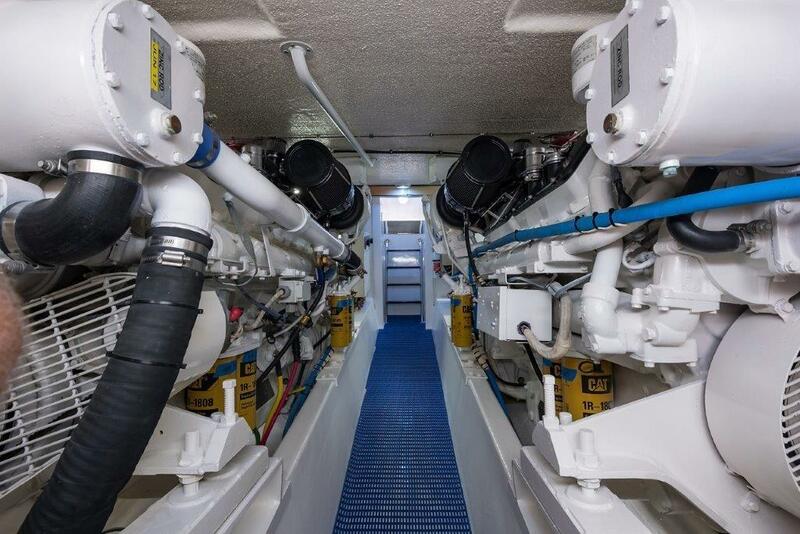 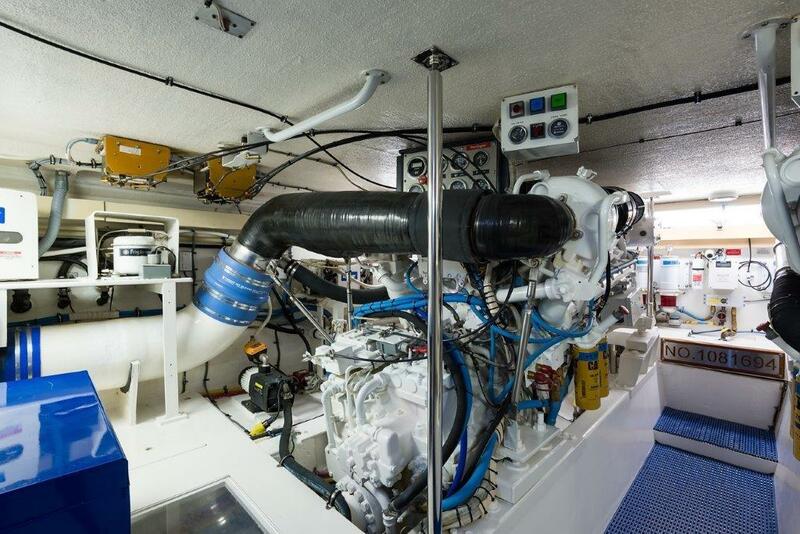 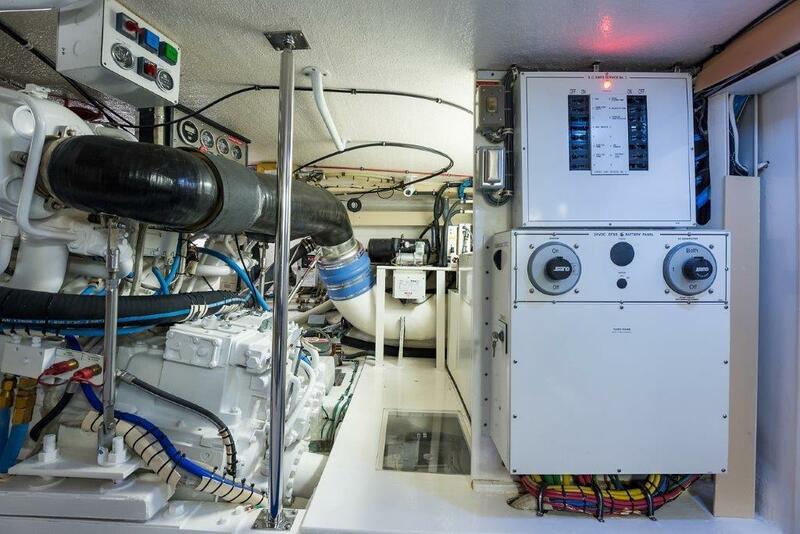 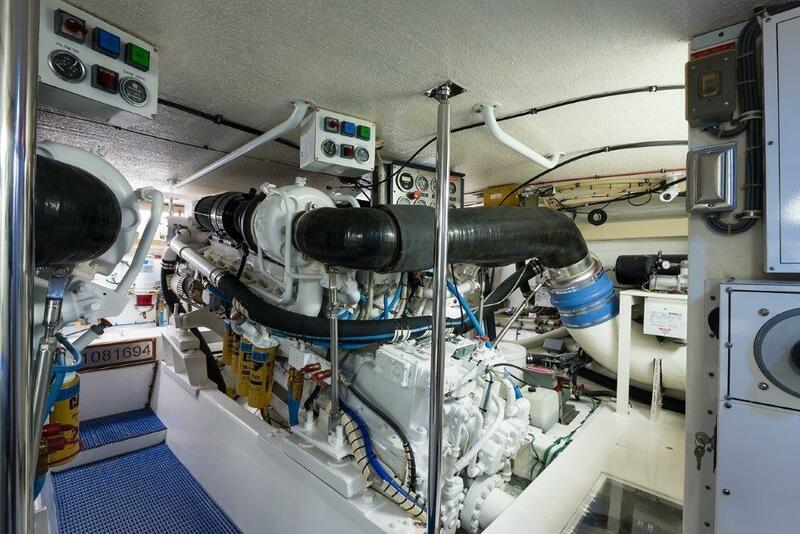 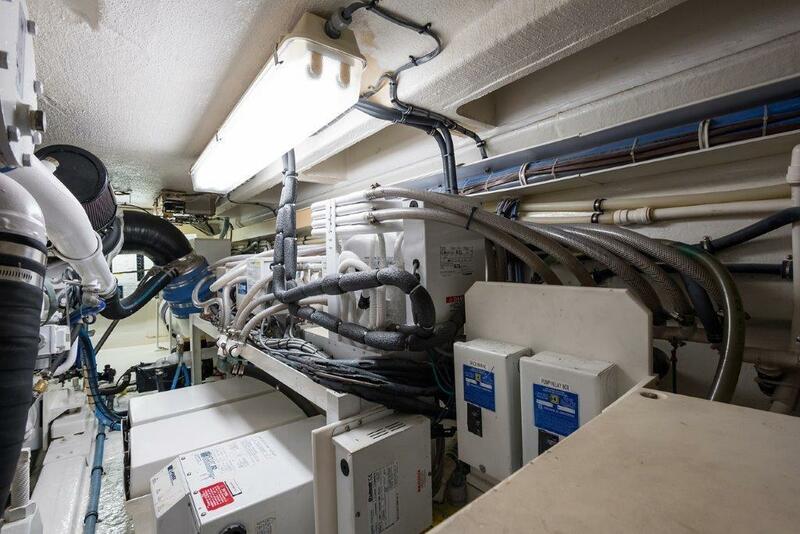 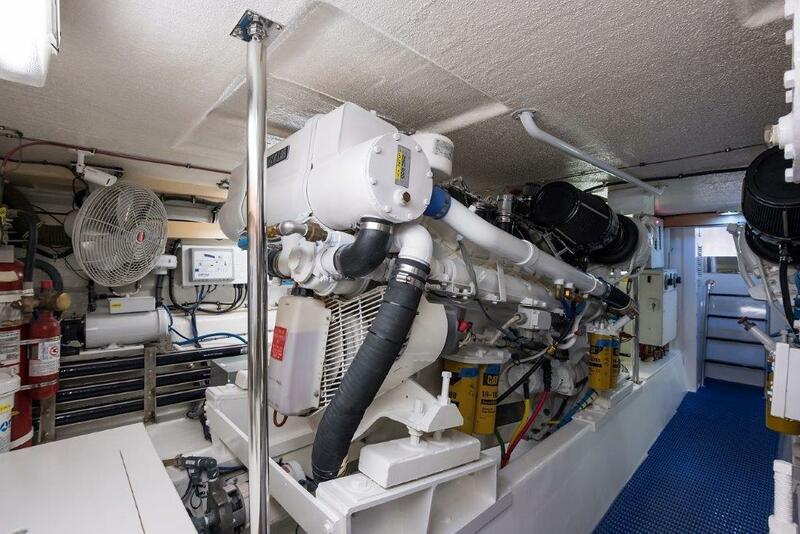 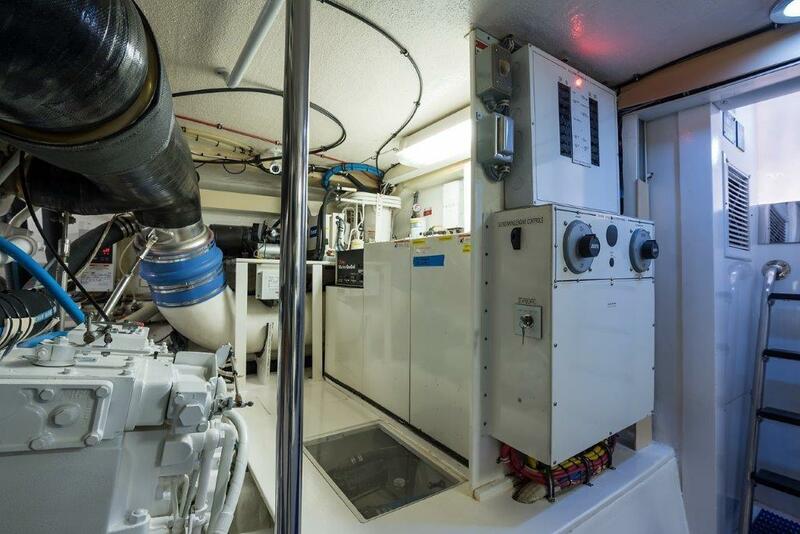 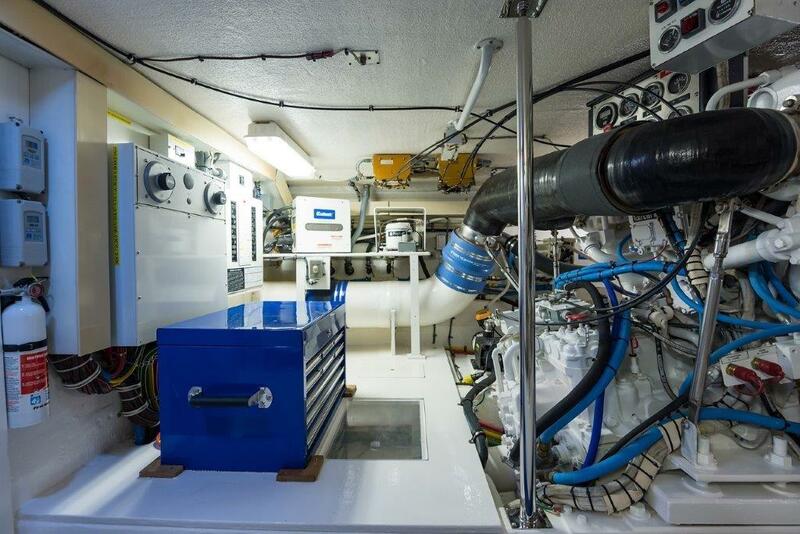 In January, 2014, at approximately 1000 hours, both main engines were completely rebuilt by Gregory Poole Marine Power who is the exclusive Caterpillar supplier to Hatteras Yachts. 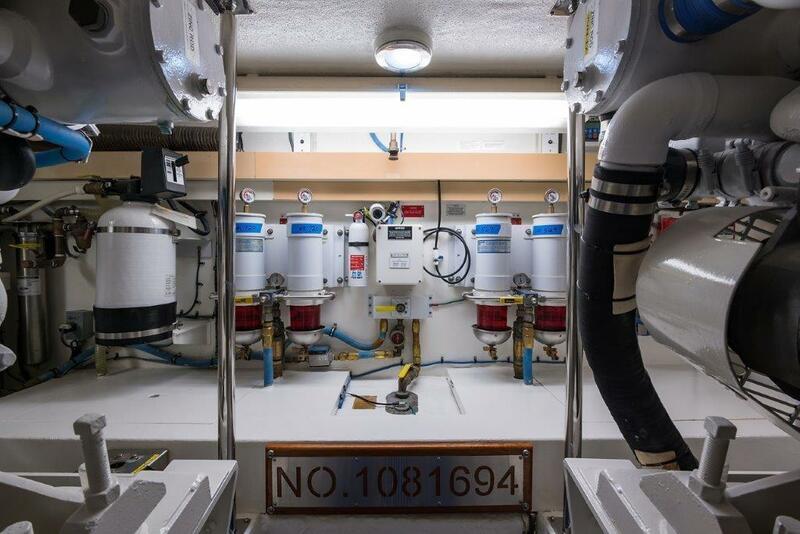 Currently, there are under 885 hours since the rebuilds. 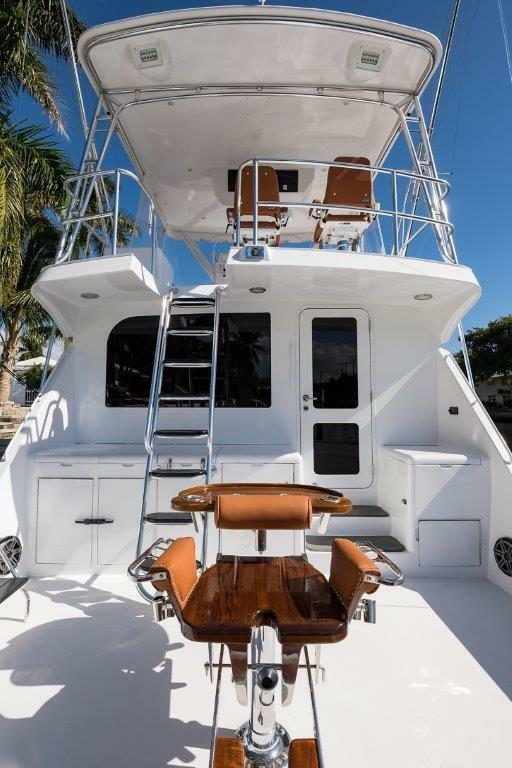 Set up to fish or cruise, she has the capacity to carry a dinghy on a remote controlled FreedomLift installed on the transom. 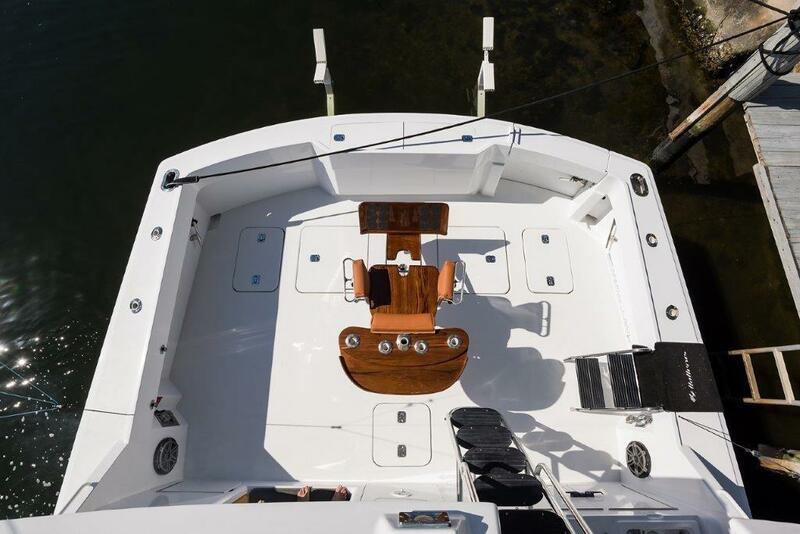 The lifting arms are easily removed for fishing and tender launching and retrieving is much easier than a davit on the bow. 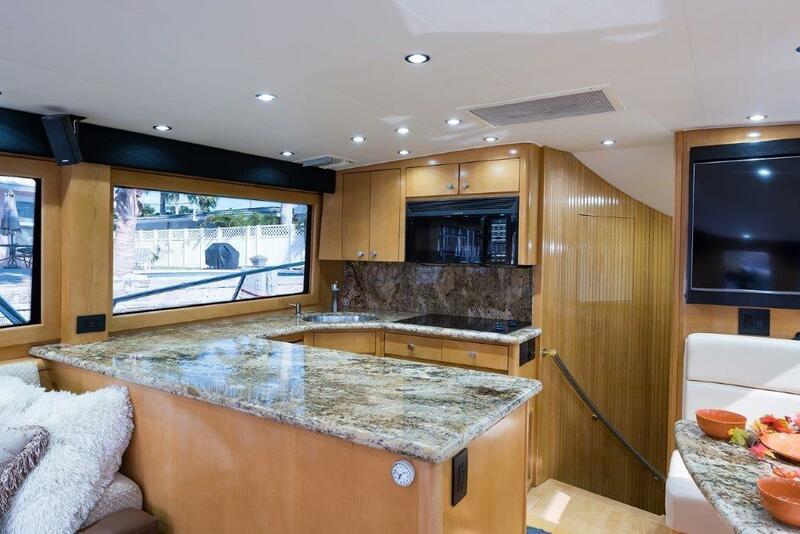 Entering the salon from the 160 square foot cockpit, one is immediately impressed with a feeling of unobstructed airiness offered by the large windows, under counter appliances, maple wood joinery and earth tone furnishings. 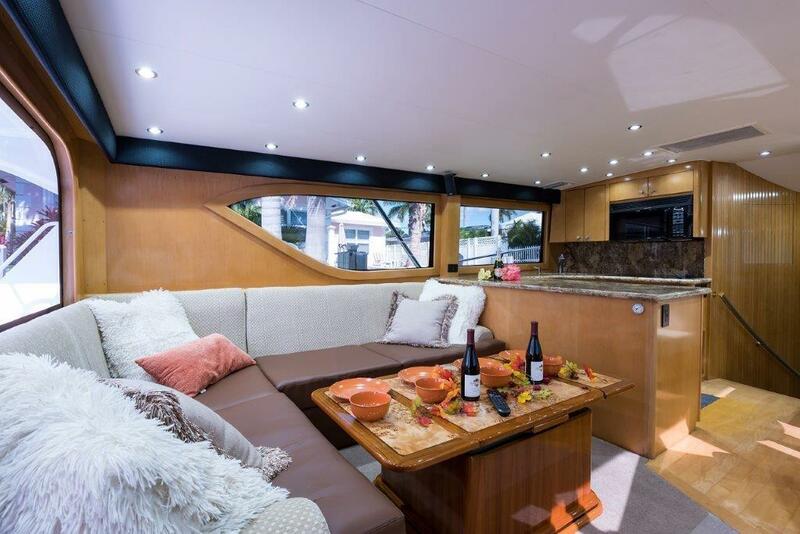 Immediately to port is a large L-shaped Ultraleather sofa with abundant storage beneath, which surrounds a high gloss teak cocktail table with burled maple lift-up top. 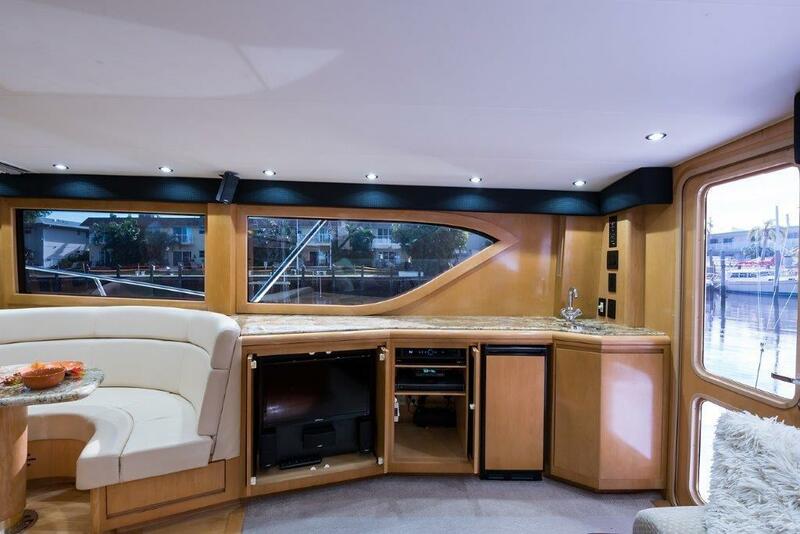 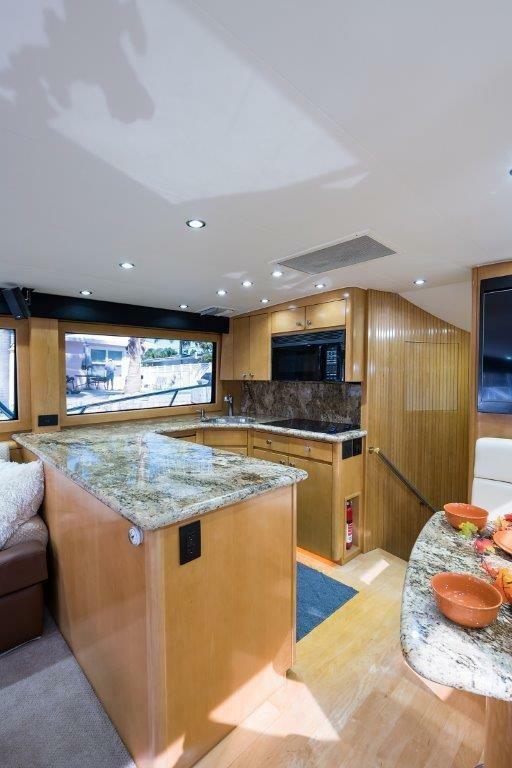 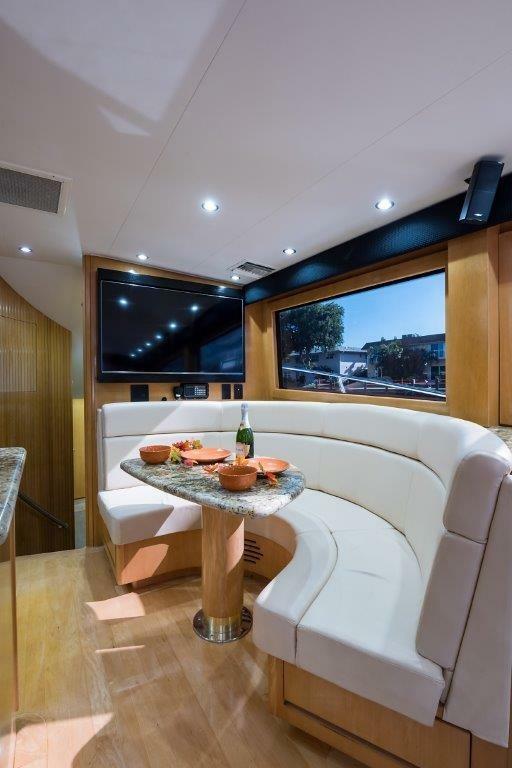 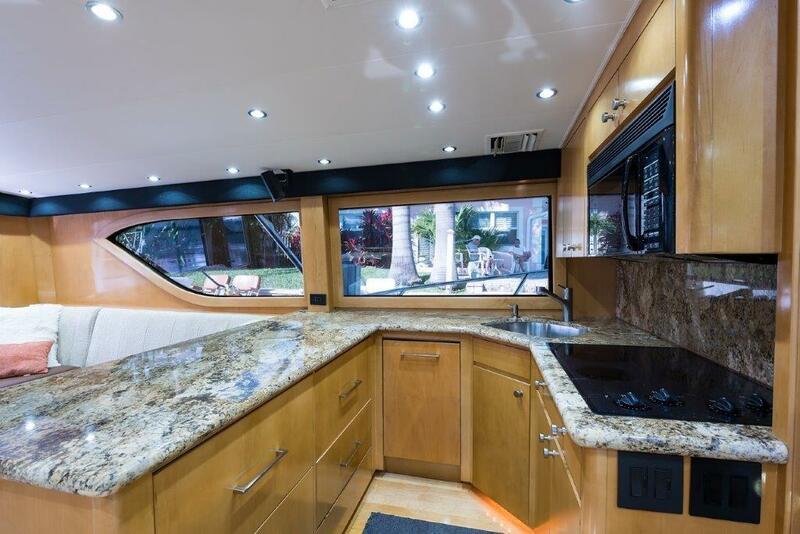 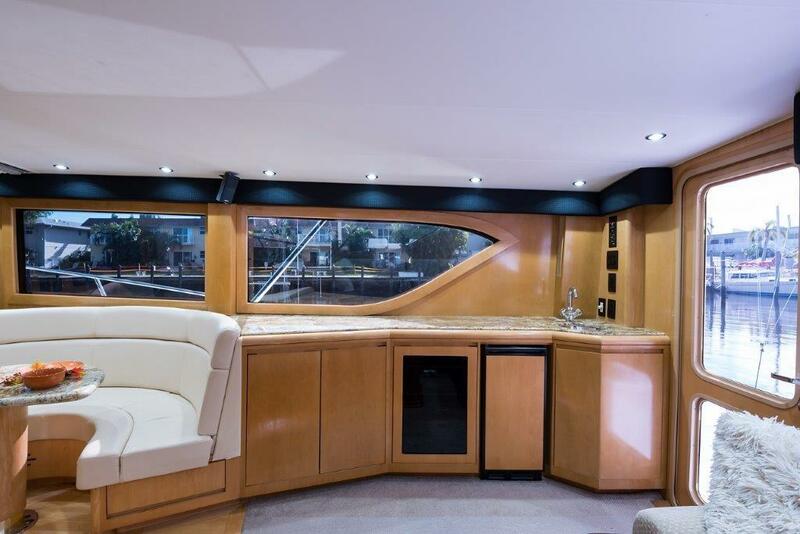 Opposite to starboard is the wet bar and entertainment center with granite countertop, and under counter cabinetry housing the new smart Samsung TV, Bose stereo system, and ice maker. 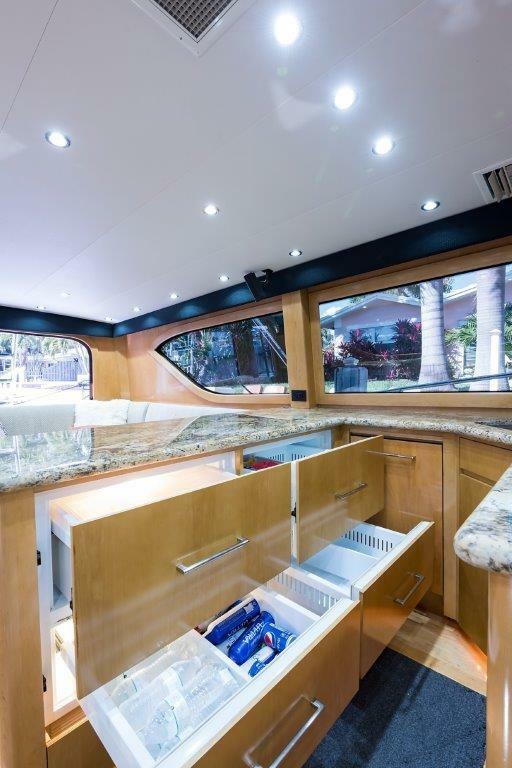 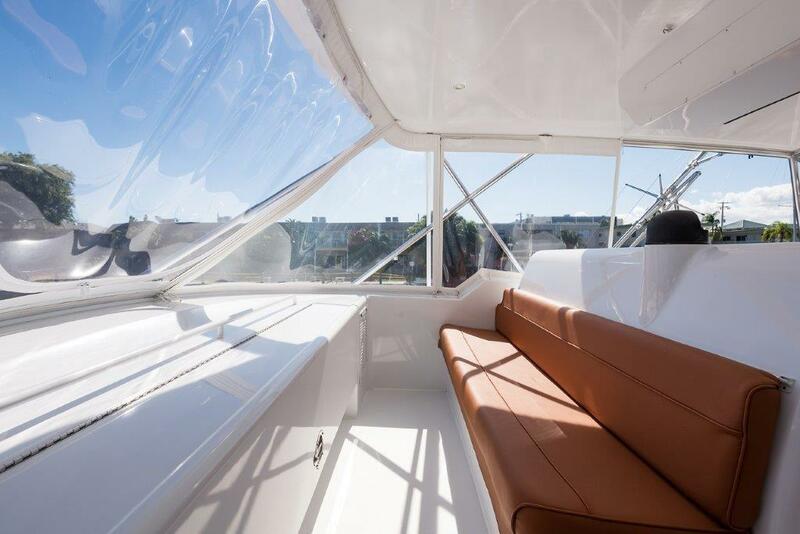 Forward to port is the galley with granite countertops, under counter Sub Zero refrigeration and abundant storage drawers and cabinets. 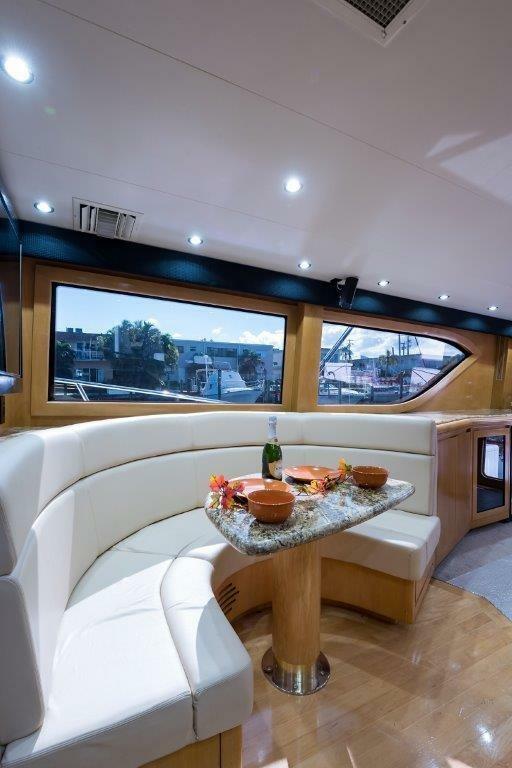 Across from the galley to starboard is the U-shaped dinette with storage beneath, surrounding a granite table top mounted on a maple wood pedestal. 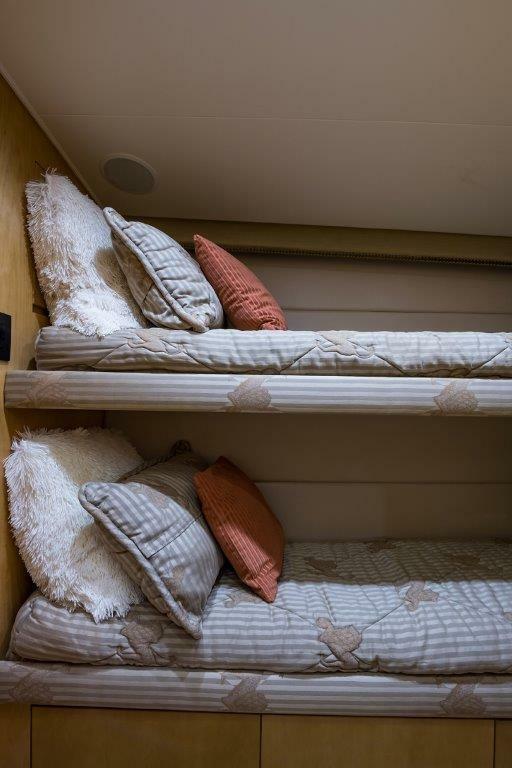 Continuing forward centerline, down four steps, through a companionway are the owner and guest accommodations. 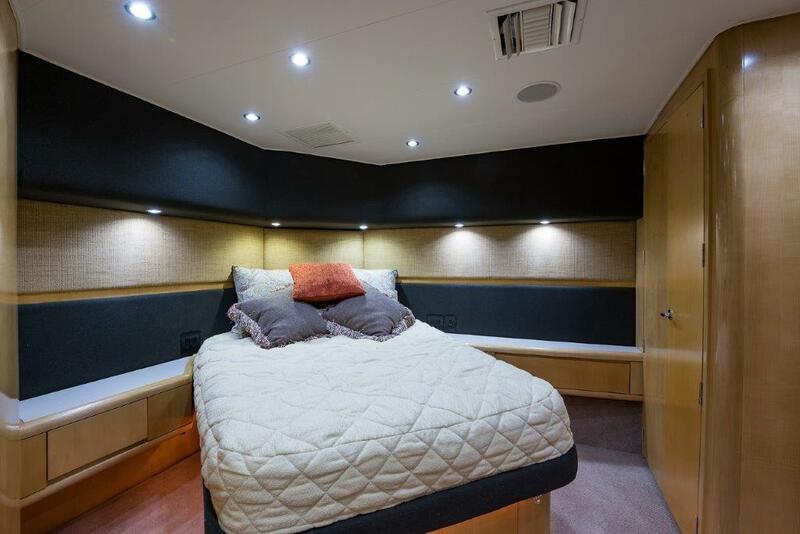 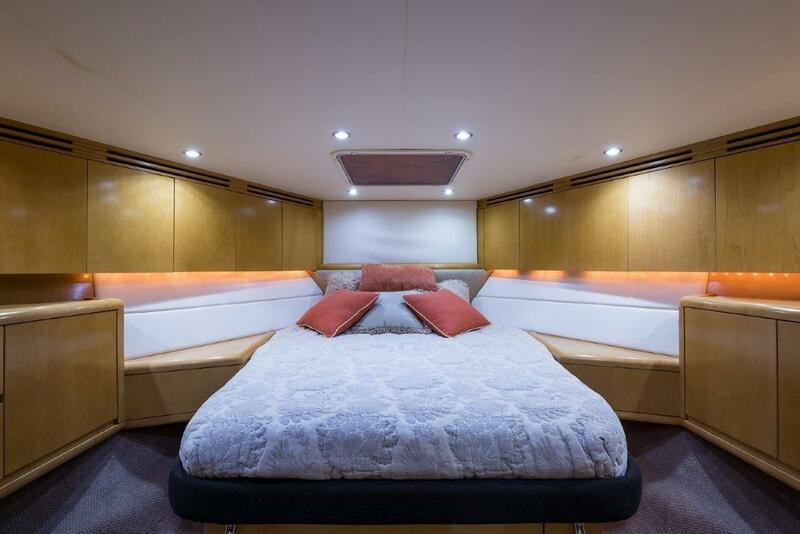 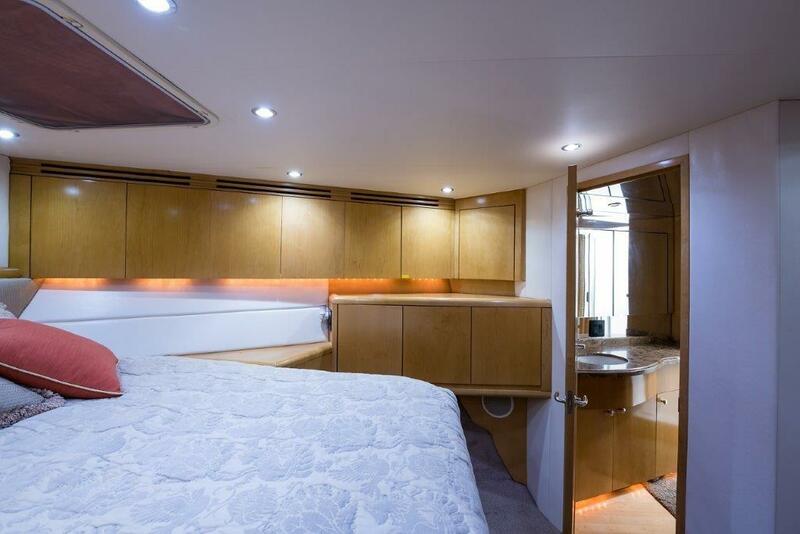 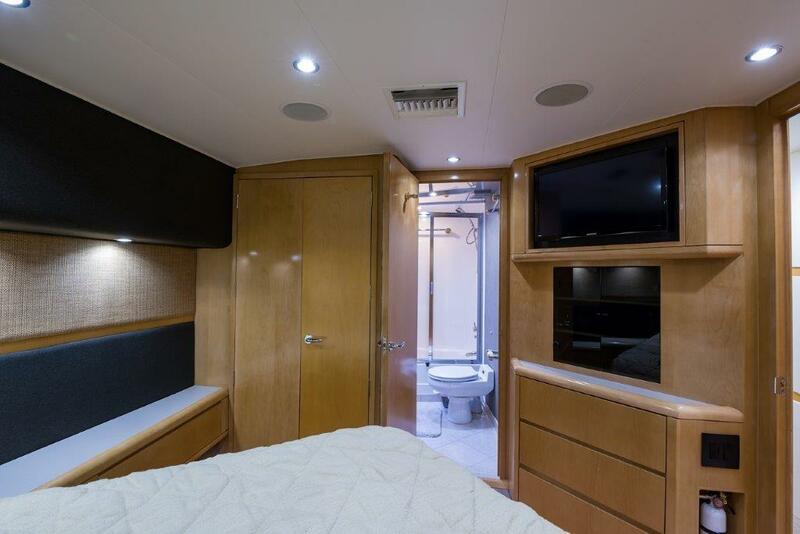 The master suite is to port and features an island queen size berth with storage beneath. 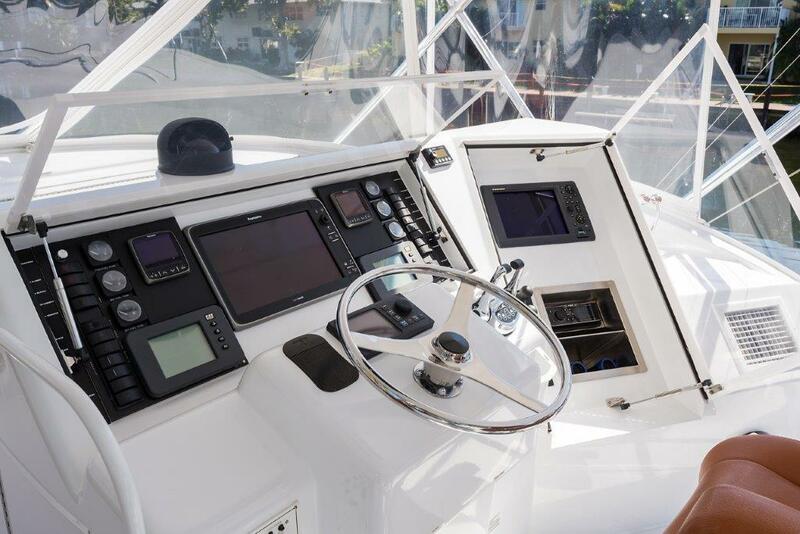 An owners safe is hidden behind a panel at the head of the berth. 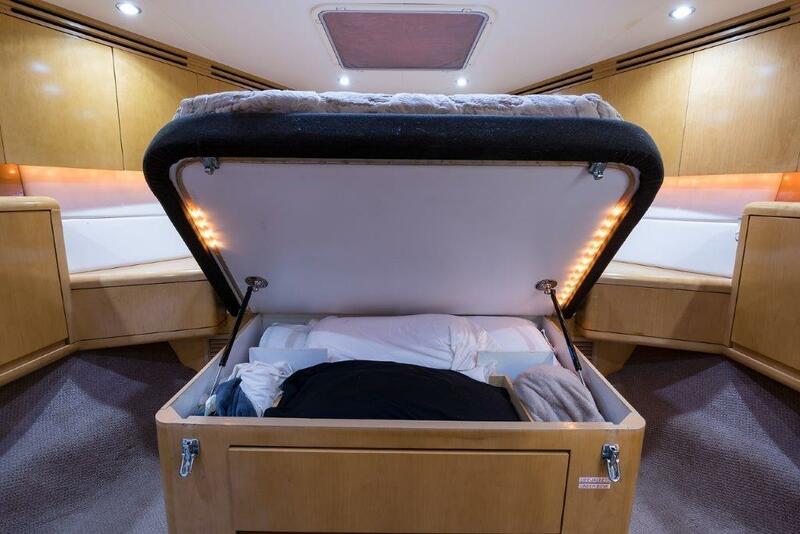 A new Samsung LED TV and built-in dresser are at the foot. 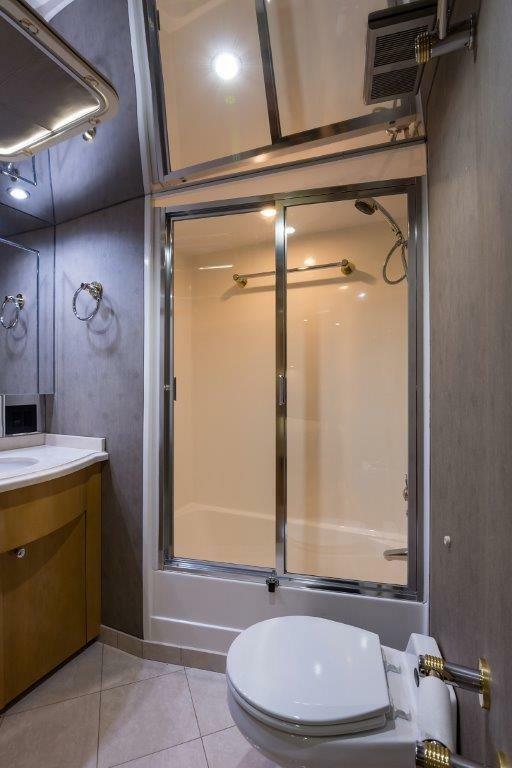 There is a large double door cedar lined hanging locker next to the entry door to the master bath with full length mirror. 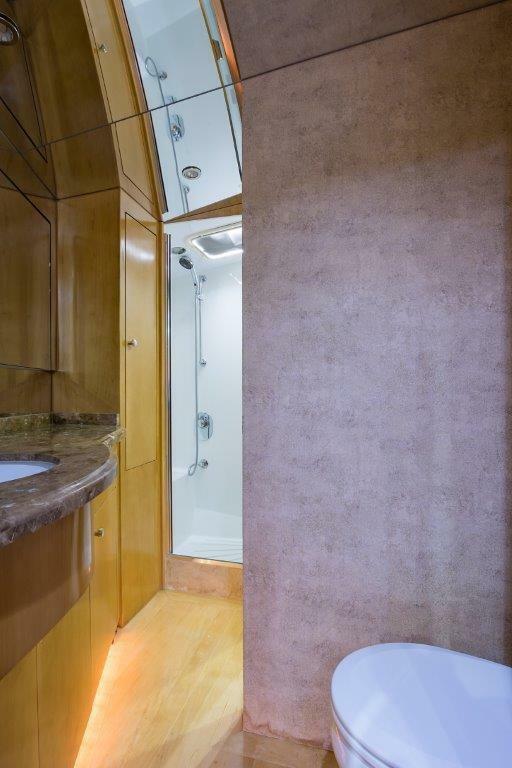 The large ensuite master bath features a tub with sliding glass door and shower, marble sole, mirrored ceiling, vanity with cultured marble top and an undermounted sink. 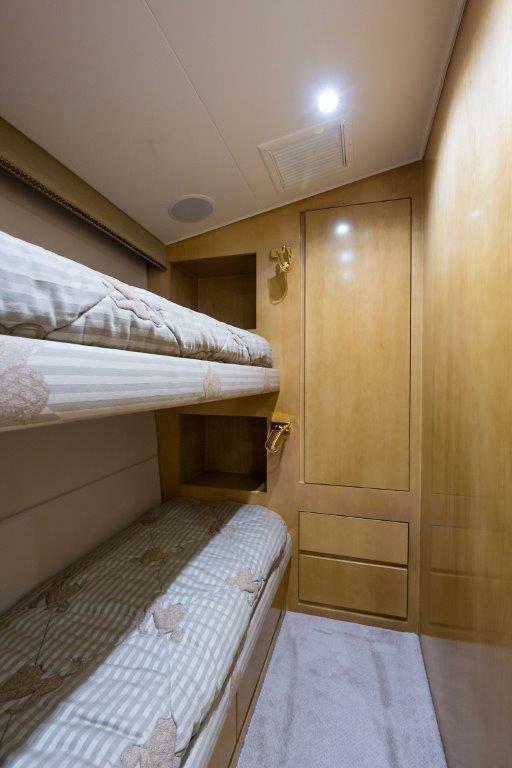 Moving forward through the companionway to starboard, is the guest/crew stateroom with upper and lower berths, two cedar lined hanging lockers, and built-in storage drawers. 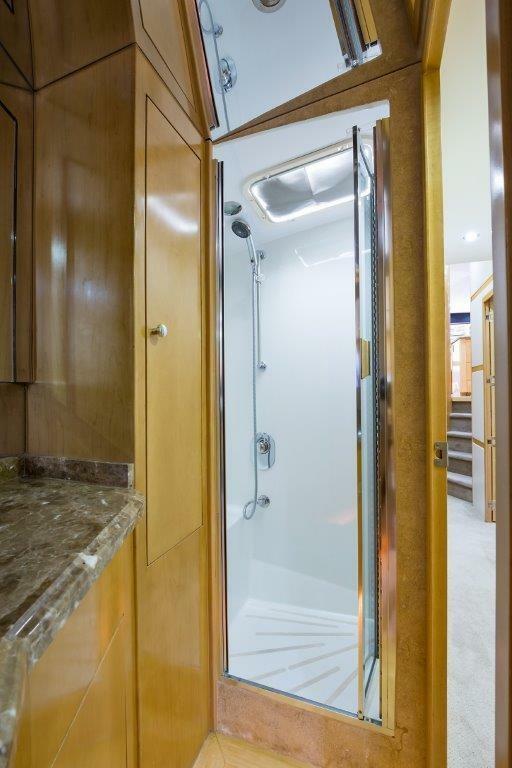 The guest bath is forward with entry doors from the companionway and the forward VIP guest stateroom. 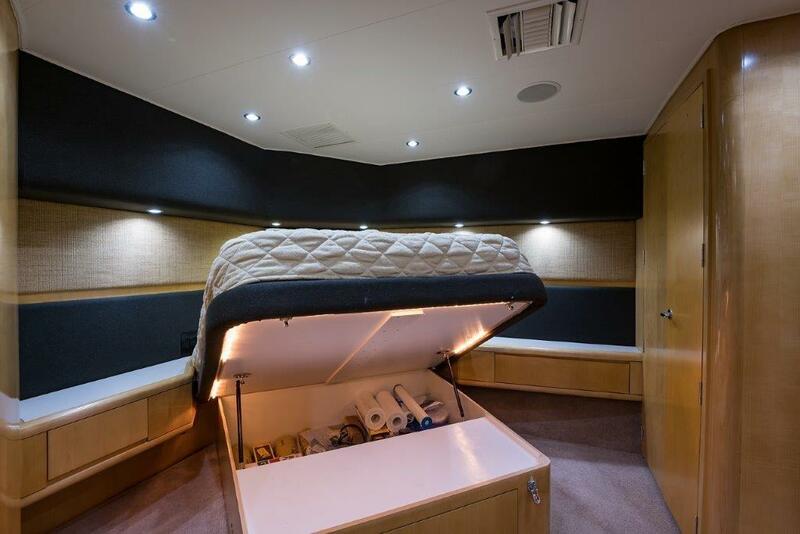 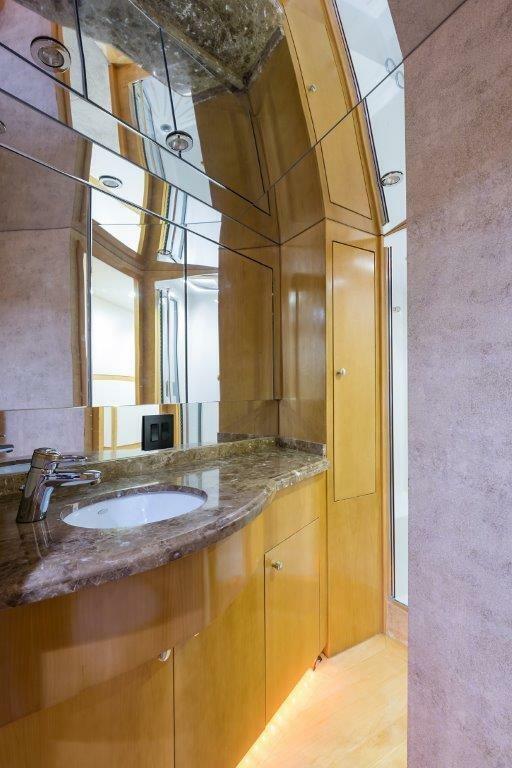 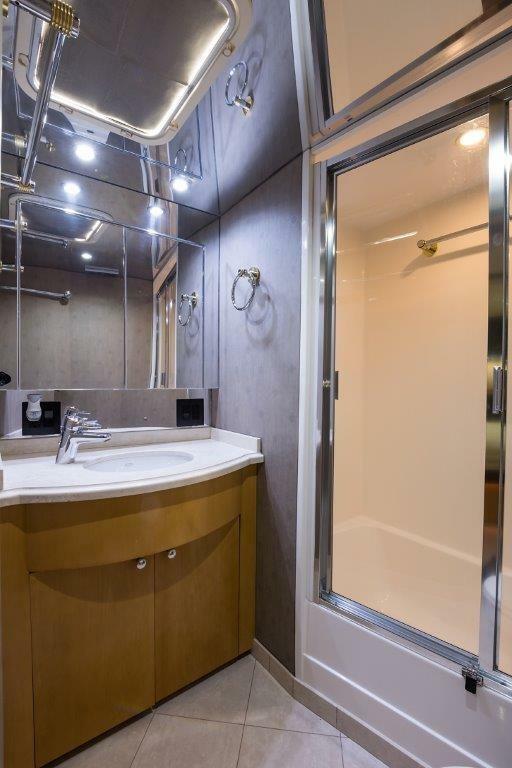 When the boat was built, the two forward heads were combined, creating a very large room with an oversized stall shower, large linen closet, oversized granite top vanity, mirrored ceiling and hard wood plank sole. 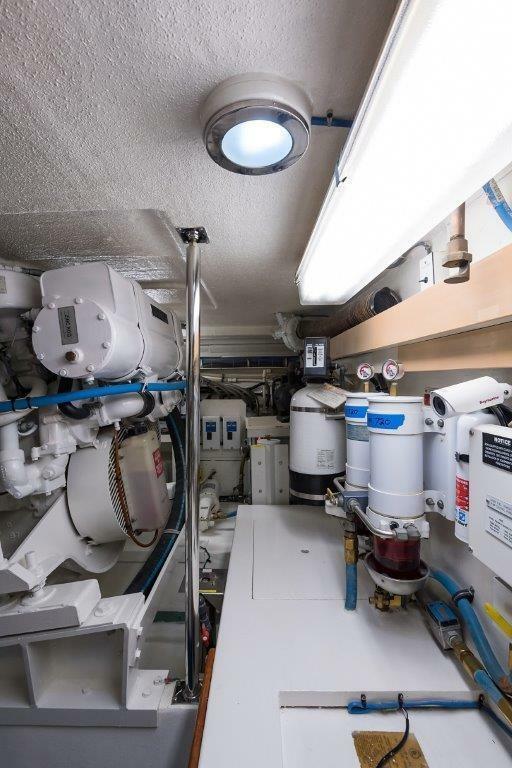 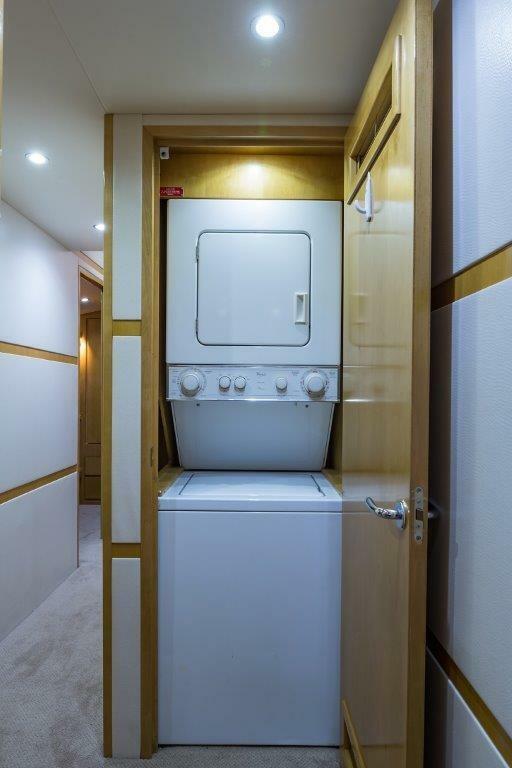 The Whirlpool stacked washer and dryer are located forward in a locker on the port side of the companionway. 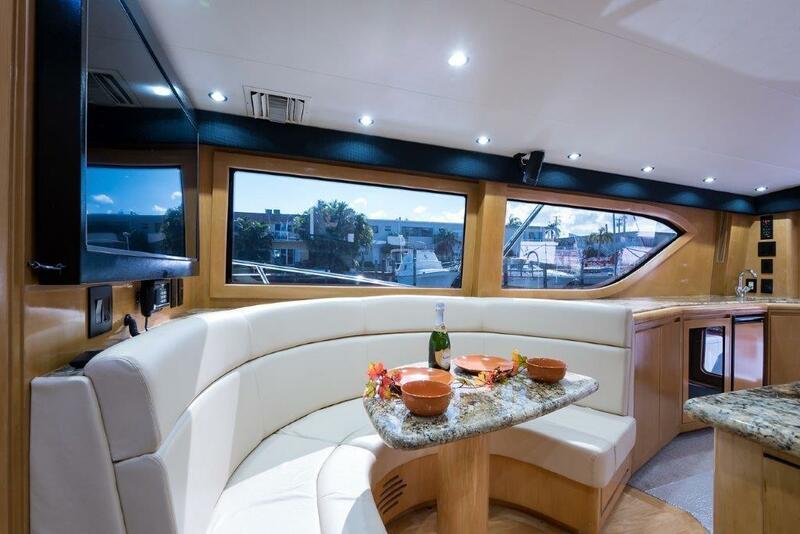 The VIP guest stateroom is all the way forward. 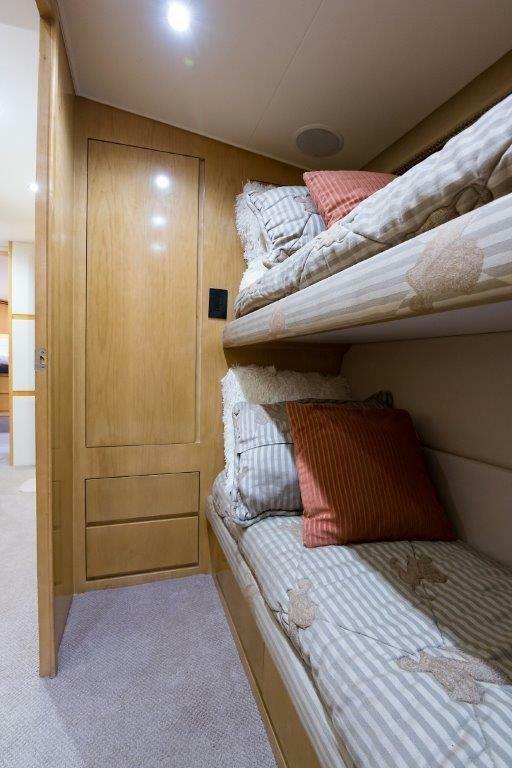 A queen size island berth is centerline with storage underneath. 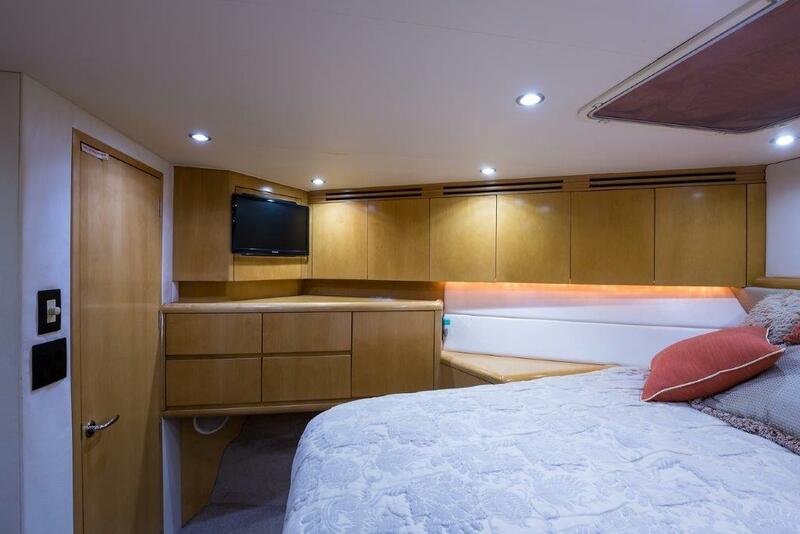 There are two cedar lined hanging lockers and lots of storage in hull side cabinets and drawers port and starboard. 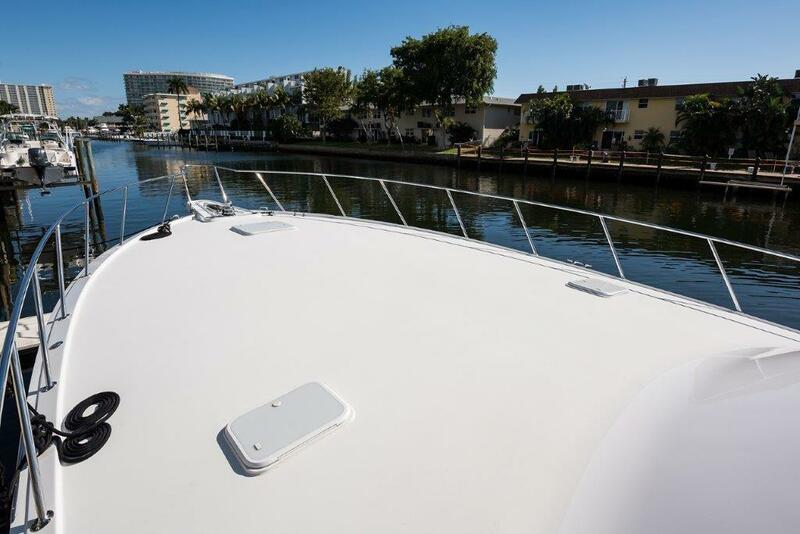 A new Samsung LED TV is mounted to port. 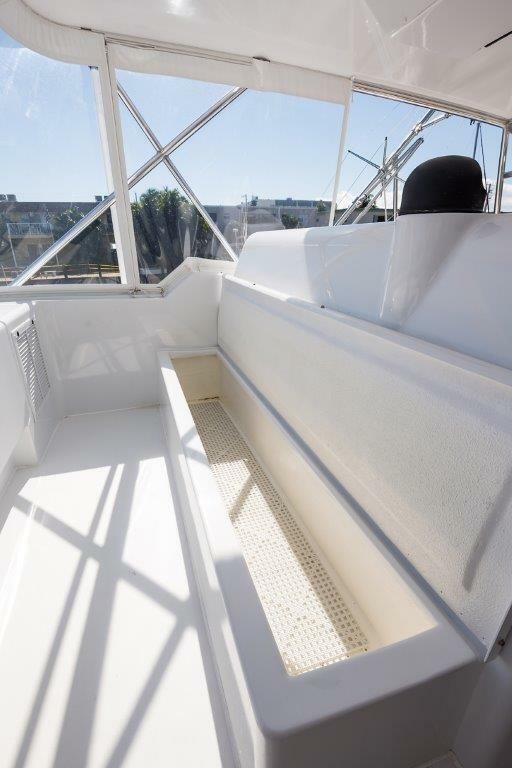 An overhead screened hatch provides natural light and an emergency exit. 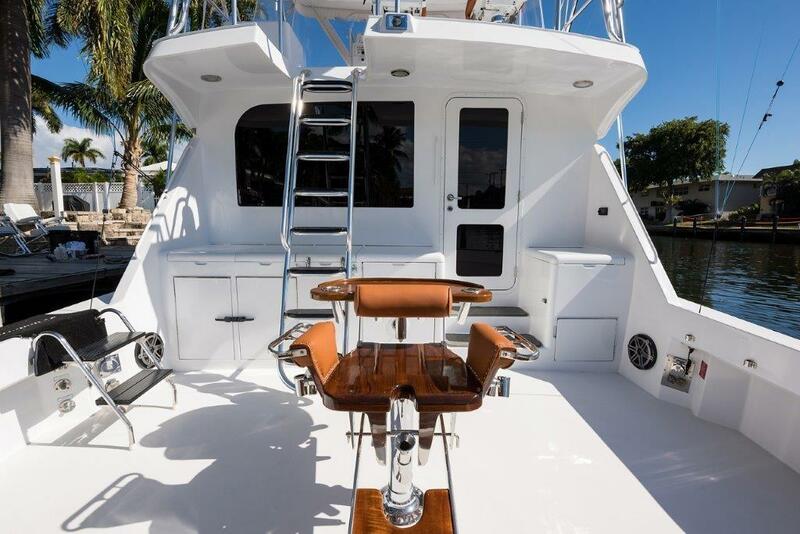 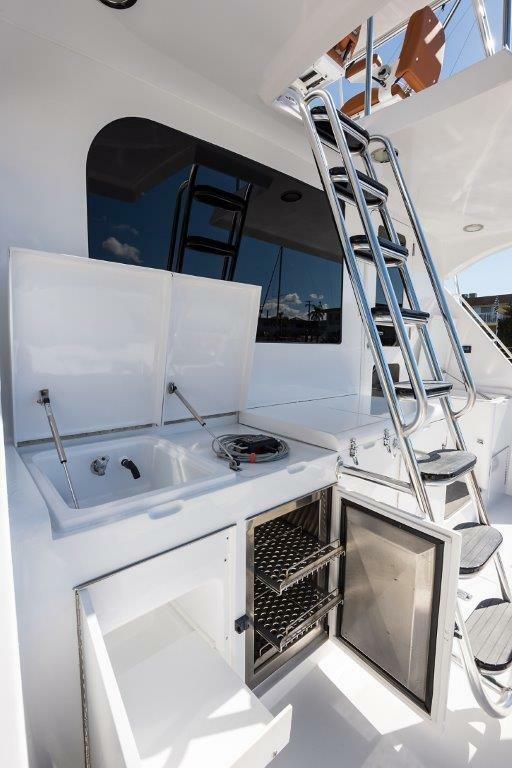 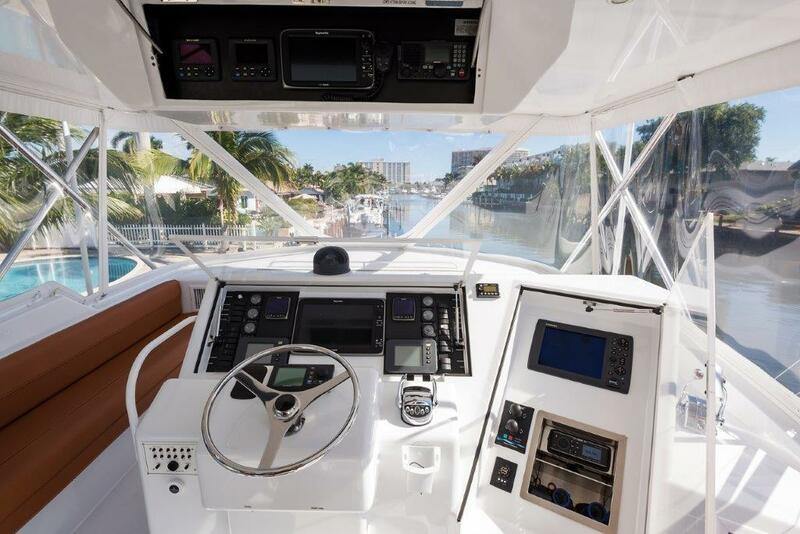 The air conditioned flybridge is accessed from the cockpit via a custom mounted stainless steel ladder which has been angled out approximately 20 degrees with larger steps creating a much easier passage to the bridge without sacrificing cockpit space and functionality. 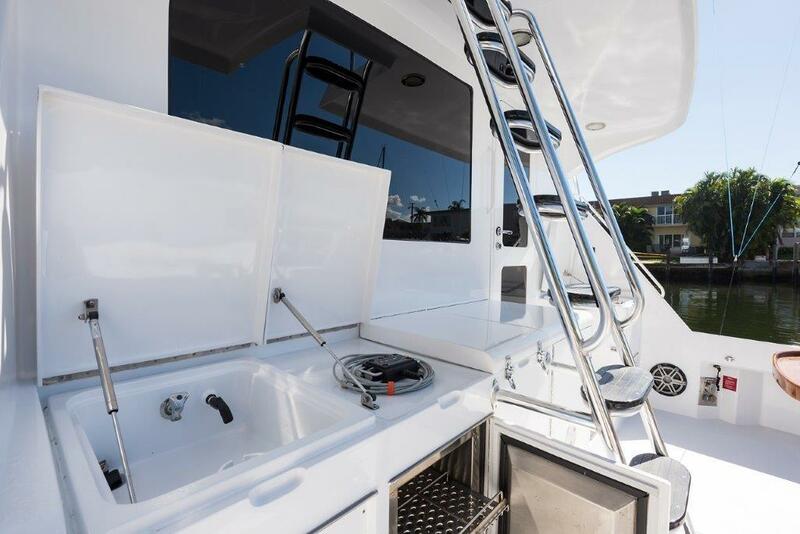 The flybridge has a full Strataglass enclosure if wanted, only 3 sides are up currently. 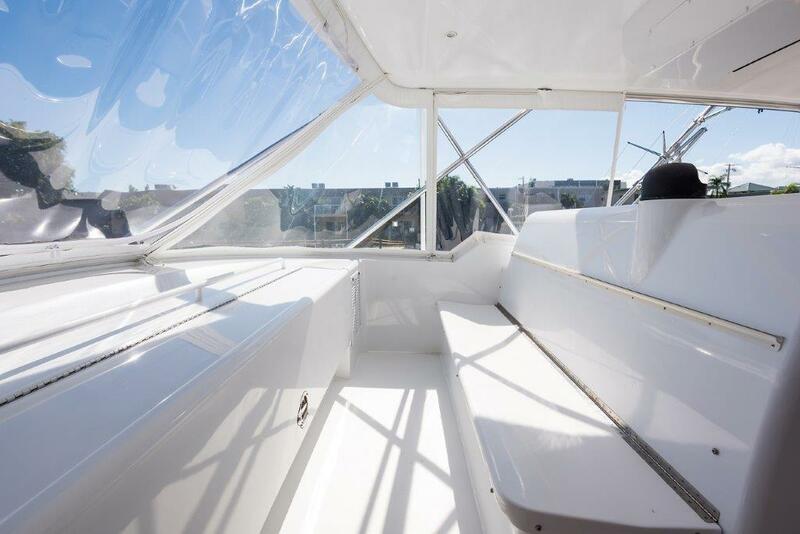 There are U-zip openings port, starboard, and aft. 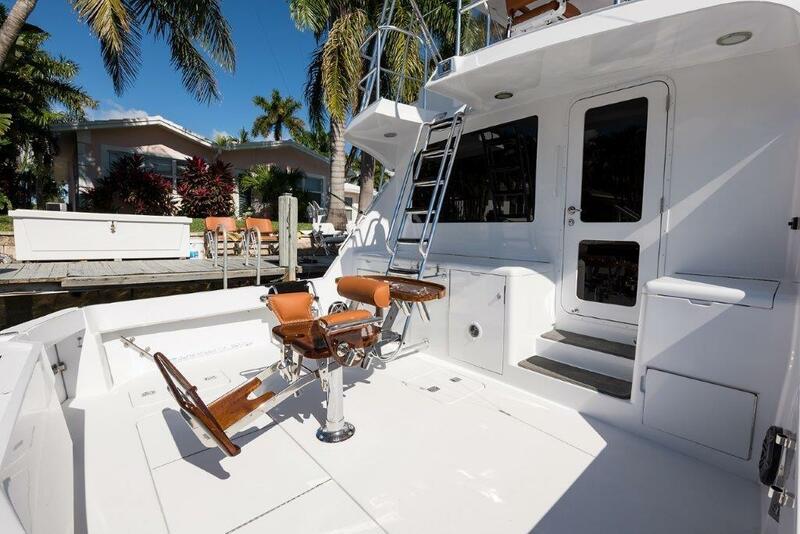 There are matching Stidd white Ultraleather helm chairs with captains chair electrically operated. 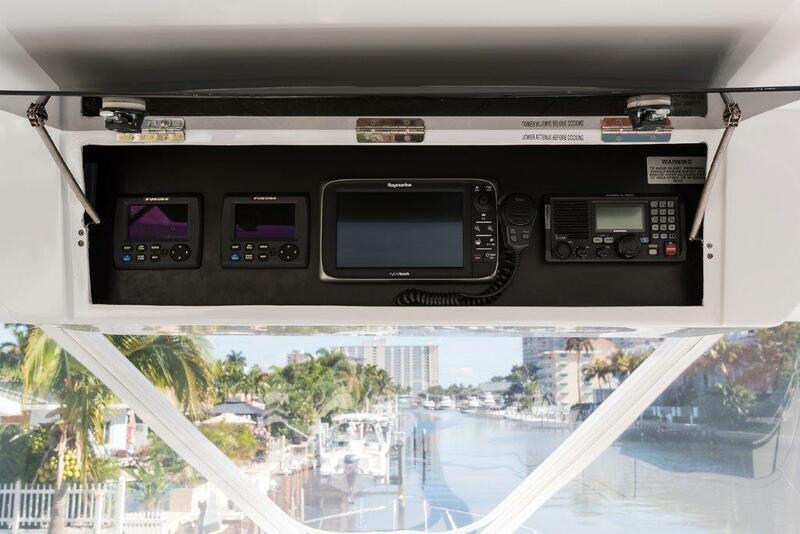 Just above the helm pod, a large console provides quick viewing of all system gauges and the Cat engine displays. 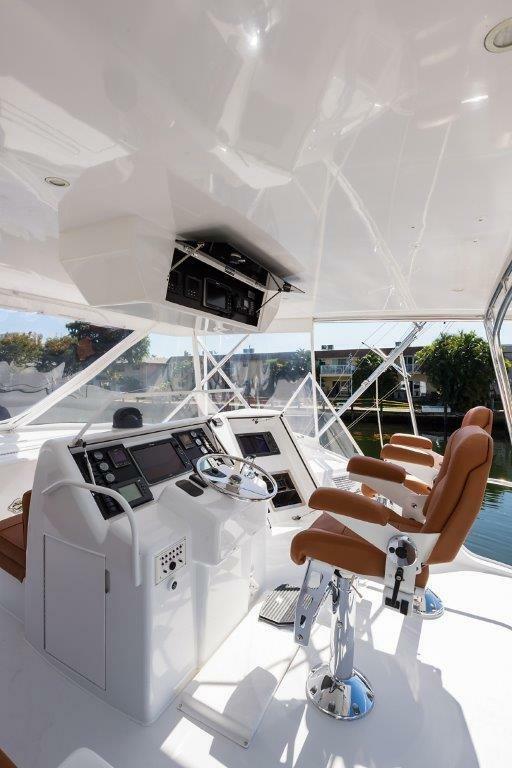 There are cushioned bench seats to port and forward of the helm, which both have rod storage beneath. 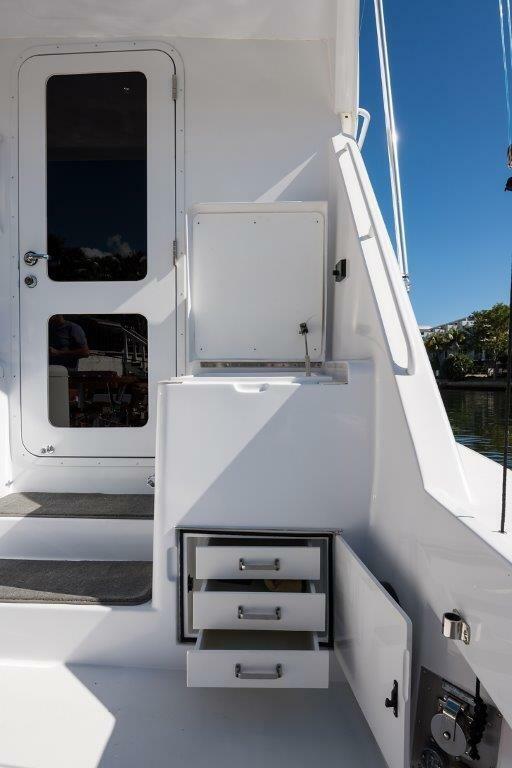 A large storage compartment is on the forward bulkhead with a pneumatic lift up lid. 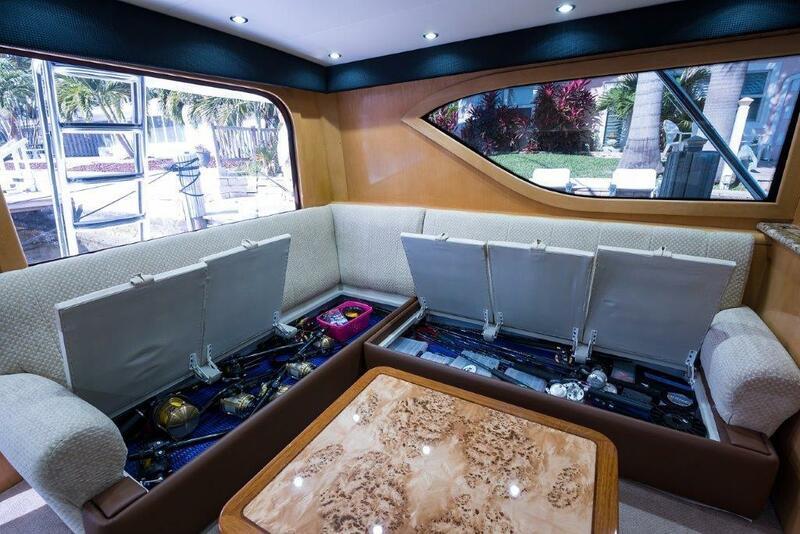 The flybridge has been wired with HDMI cable from the salon sat TV receiver for a portable television. 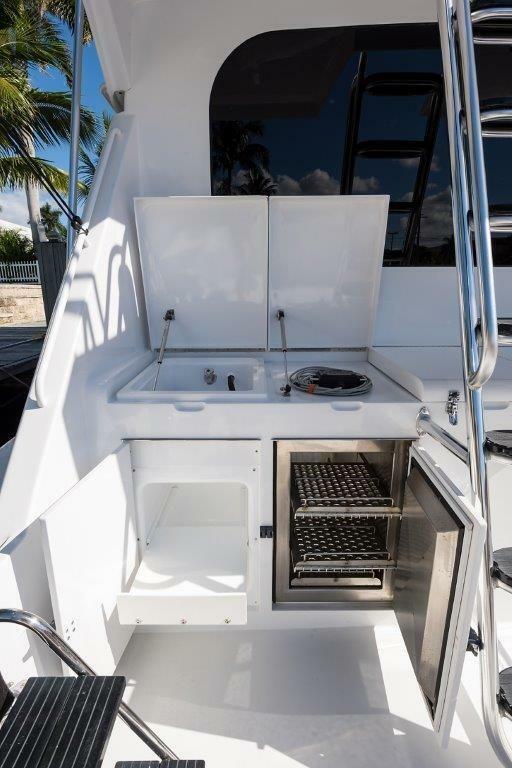 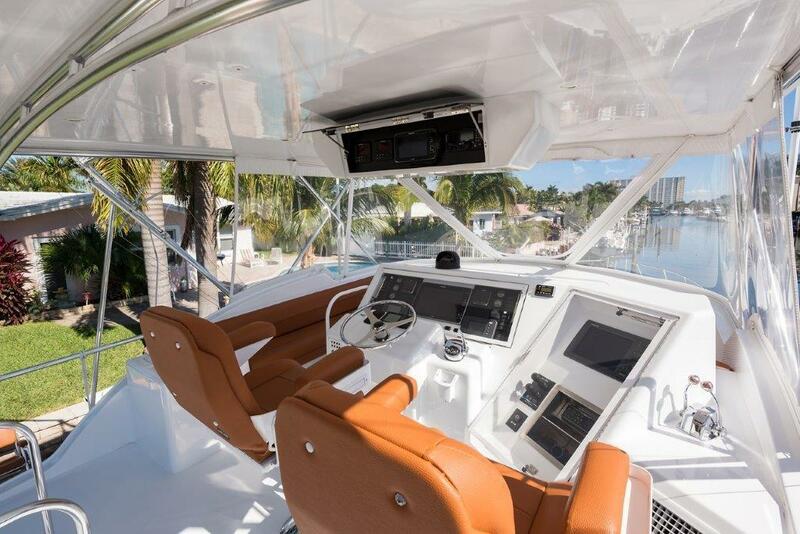 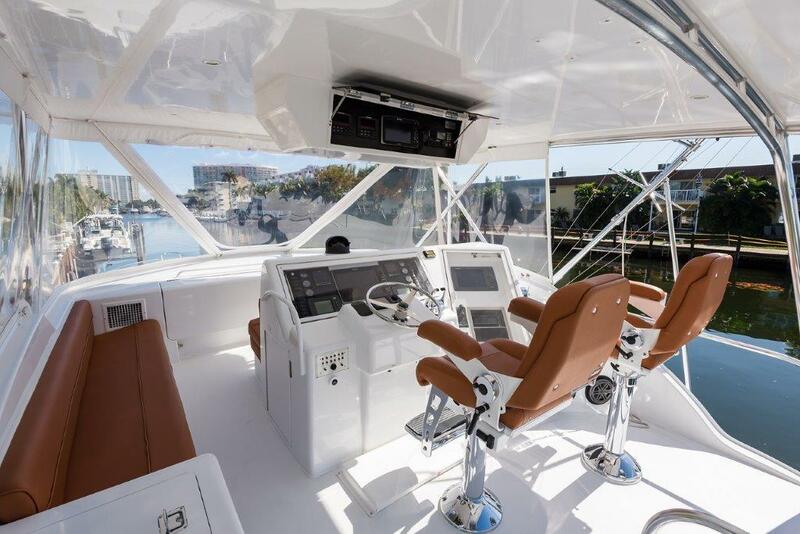 The spacious cockpit features a bait prep station, tackle center, cold plate refrigeration, freezer, and insulated cold box with an Eskimo ice feed all on the forward bulkhead. 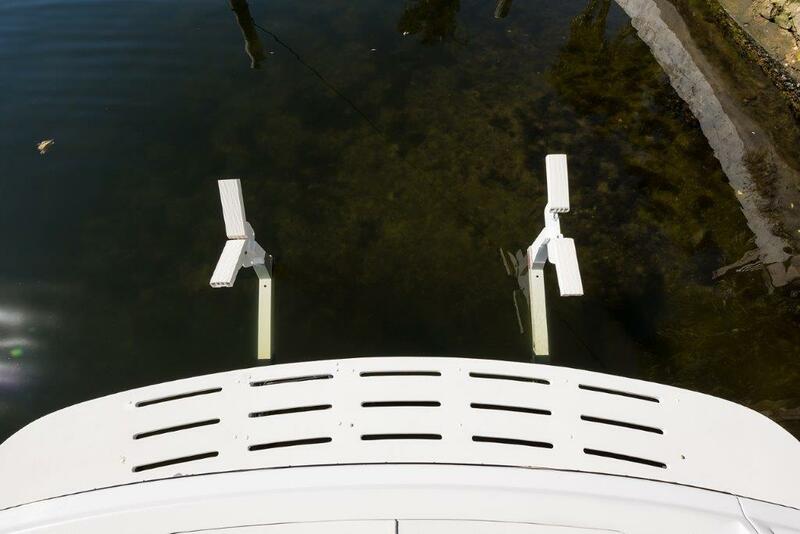 Fresh and raw water wash downs as well as dockside water hook up is forward on the port side. 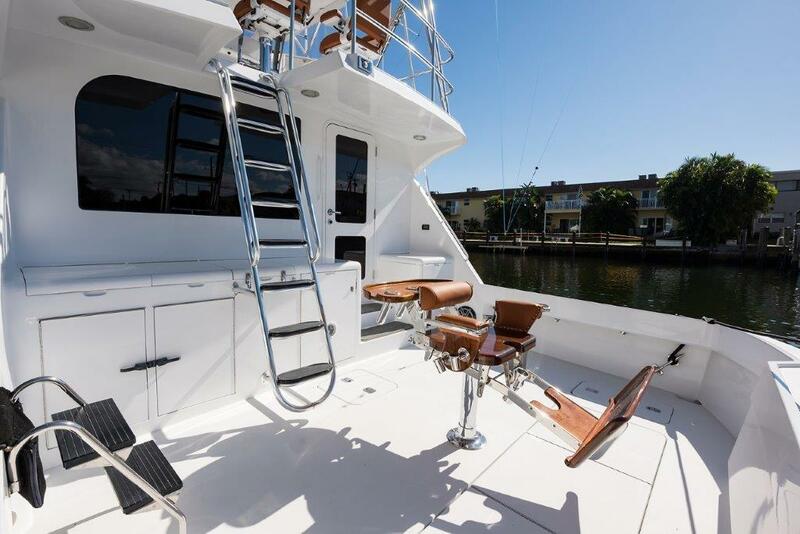 There is a Pompanette chair with rocket launcher in center of cockpit. 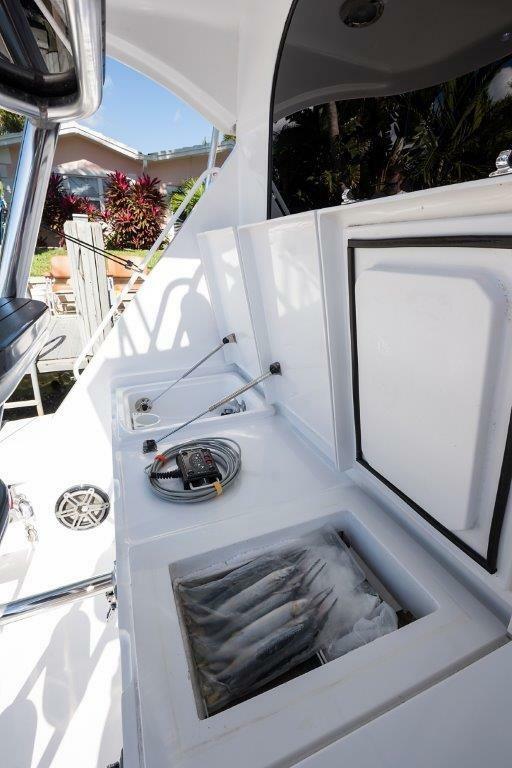 There are two large macerated in deck fish boxes aft and there is a transom holding box. 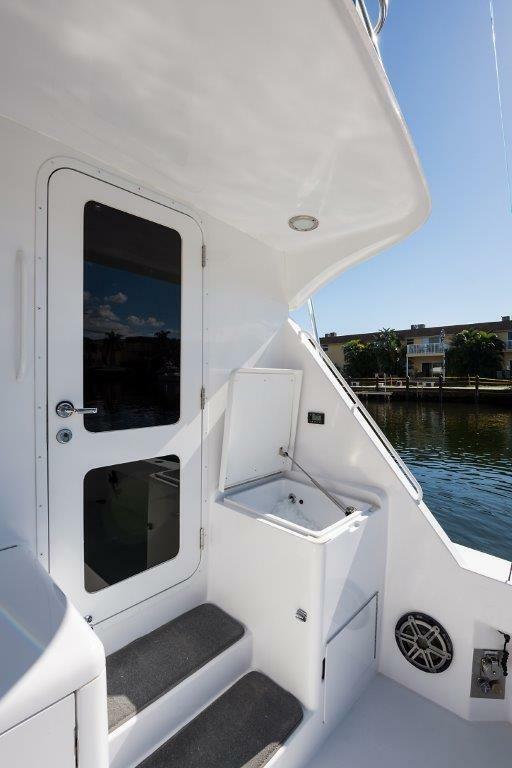 A transom door is to port. 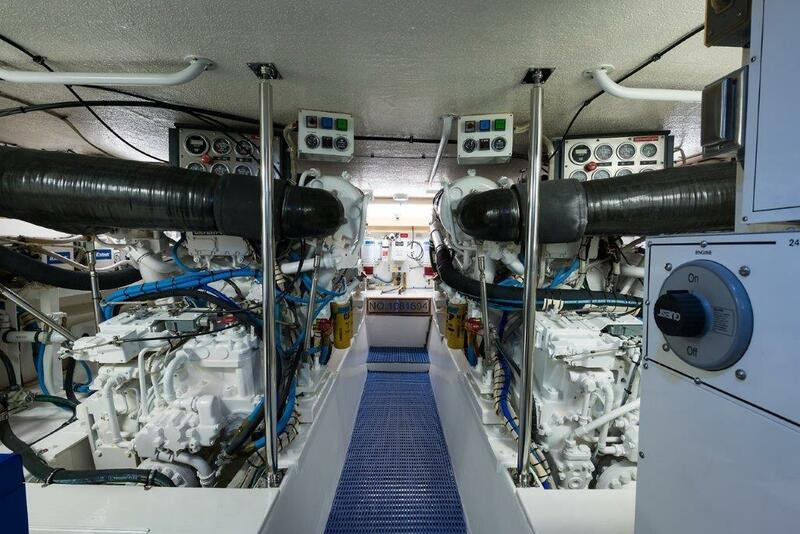 The engine room is truly a show piece and will meet all expectations you will have.